2011-04-01 First worldwide family litigation filed litigation Critical https://patents.darts-ip.com/?family=34889465&utm_source=google_patent&utm_medium=platform_link&utm_campaign=public_patent_search&patent=KR101337689(B1) "Global patent litigation dataset” by Darts-ip is licensed under a Creative Commons Attribution 4.0 International License. 광범위한 파장대에서, 질화물 반도체층의 조성 분포, 예를 들면, 활성층의 결정성이나 In 함유량을 균일하게 하여, 수명 특성 및 소자 특성이 한층 더 우수한 소자를 제공하는 것을 목적으로 한다. Over a wide wavelength range, chemical composition of the nitride semiconductor layer, for example, and an object thereof to uniform the crystallinity, or the In content of the active layer, to provide a life characteristic and the device characteristics are more excellent device. 질화물 반도체 기판의 주면 상에 제1 도전형의 질화물 반도체층과, 활성층과, 제1 도전형과는 다른 도전형을 한 제2 도전형의 질화물 반도체층과, 상기 제2 도전형의 질화물 반도체층에 스트라이프 형상의 릿지부를 구비하여 이루어지는 질화물 반도체 레이저 소자로서, 상기 질화물 반도체 기판의 주면에는, 기준 결정면에 대하여, 적어도 상기 스트라이프 형상의 릿지부와 대략 평행 방향으로, 오프각 a(θ a )를 갖고 있거나, 혹은, 이 오프각 a(θ a )와 대략 수직 방향으로 오프각 b(θ b )를 갖고 있는 질화물 반도체 레이저 소자이다. The first nitride semiconductor layer of a conductivity type on the principal surface of the nitride semiconductor substrate, an active layer, a first conductivity type and has a second conductive type nitride semiconductor layer, the second conductive type nitride semiconductor layer other conductivity type to have a stripe-shaped ridge of a nitride semiconductor laser device composed by comprising a, in the main surface of said nitride semiconductor substrate, with respect to the reference crystal plane, at least in the ridge portion and substantially parallel to the direction of the stripe-like, off angle a (θ a) or, or, a nitride semiconductor laser device having the off angle a (θ a) and substantially vertically off angle b (θ b). 도 1은 본 발명의 질화물 반도체 레이저 소자의 모식적 사시도. 1 is a schematic perspective view of a nitride semiconductor laser device of the present invention. 도 2는 본 발명의 질화물 반도체 기판의 모식적 단면도. Figure 2 is a schematic cross-sectional view of the nitride semiconductor substrate of the present invention. 도 3은 본 발명의 질화물 반도체 기판의 오프각을 설명하기 위한 도면. Figure 3 is a view for explaining the off angle of a nitride semiconductor substrate according to the present invention. 도 4는 본 발명의 질화물 반도체 기판의 다른 오프각을 설명하기 위한 도면. Figure 4 is a view for explaining another off angle of a nitride semiconductor substrate according to the present invention. 도 5는 종래의 질화물 반도체 레이저 소자의 마이크로 PL 측정 데이터를 도시하는 도면. Figure 5 is a view showing a micro-PL measurement data for a conventional nitride semiconductor laser device. 도 6은 본 발명의 질화물 반도체 레이저 소자의 마이크로 PL 측정 데이터를 도시하는 도면. Figure 6 is a view showing a micro-PL measurement data for a nitride semiconductor laser device of the present invention. 도 7은 본 발명의 질화물 반도체 기판의 일 제조 공정을 도시하는 단면도. 7 is a cross-sectional view illustrating one process of manufacturing the nitride semiconductor substrate of the present invention. 도 8은 본 발명의 질화물 반도체 레이저 소자의 일 제조 공정을 도시하는 단면도. 8 is a cross-sectional view illustrating one process of manufacturing the nitride semiconductor laser device of the present invention. 도 9는 본 발명의 질화물 반도체 레이저 소자의 라이프 데이터를 도시하는 도면. 9 is a view illustrating a life data for a nitride semiconductor laser device of the present invention. 도 10은 본 발명의 질화물 반도체 레이저 소자에서의 활성 영역의 혼정 불균일을 마이크로 포토 루미네센스(μ-PL)에 의해 측정한 단면도(a) 및 질화물 반도체 층의 표면 상태를 관찰한 단면도(b). 10 is observing the surface condition of the nitride semiconductor laser device having a cross-sectional view (a) and the nitride semiconductor layer measures the mixed crystal unevenness in the active region by the micro-photoluminescence (μ-PL) in the present invention, a sectional view (b) . 도 11은 비교예1의 질화물 반도체 레이저 소자에서의 활성 영역의 혼정 불균일을 마이크로 포토 루미네센스(μ-PL)에 의해 측정한 단면도(a) 및 질화물 반도체층의 표면 상태를 관찰한 단면도(b). 11 is a comparative example in which a cross-sectional view (a) and a cross-sectional view of observing the surface condition of the nitride semiconductor layer as measured by a mixed crystal unevenness in the active region of the nitride semiconductor laser device of the first micro-photoluminescence (μ-PL) (b ). 도 12는 비교예2의 질화물 반도체 레이저 소자에서의 활성 영역의 혼정 불균일을 마이크로 포토 루미네센스(μ-PL)에 의해 측정한 단면도(a) 및 질화물 반도체층의 표면 상태를 관찰한 단면도(b). 12 is a comparative example nitrides of measuring a mixed crystal unevenness in the active region by the micro-photoluminescence (μ-PL) cross-sectional view of the semiconductor laser element. 2 (a) and a cross-sectional view of observing the surface condition of the nitride semiconductor layers (b ). 도 13은 비교예3의 질화물 반도체 레이저 소자에서의 활성 영역의 혼정 불균일을 마이크로 포토 루미네센스(μ-PL)에 의해 측정한 단면도(a) 및 질화물 반도체층의 표면 상태를 관찰한 단면도(b). Figure 13 is a mixed crystal unevenness in the active region of the nitride semiconductor laser element of Comparative Example 3 micro-photoluminescence (μ-PL) is a sectional view (a) and a cross-sectional view of observing the surface condition of the nitride semiconductor layer is determined by (b ). [특허 문헌1] 일본 특개2002-16000호 공보 Patent Document 1: Japanese Patent Laid-Open 2002-16000 No. 본 발명은, In을 함유하는 활성층을 구비한 질화물 반도체 레이저 소자 및 레이저 다이오드, 발광 다이오드(LED), 수광 소자, 고주파 트랜지스터, 고내압 트랜지스터 등의 질화물 반도체 소자에 관한 것이다. The present invention relates to a nitride semiconductor device such as a nitride semiconductor laser device and a laser diode, light emitting diode (LED), light receiving element, a high frequency transistor, high-voltage transistor with an active layer containing In. 특히, 특정한 오프각을 갖는 질화물 반도체 기판을 이용함으로써 소자 특성이 개선된 질화물 반도체 레이저 소자 및 질화물 반도체 소자에 관한 것이다. In particular, by using a nitride semiconductor substrate having a specific off angle relates to a nitride semiconductor laser device, and a nitride semiconductor device is improved device characteristics. GaN 등의 질화물 반도체로 이루어지는 레이저 소자는, 발진 파장을, 370㎚ 이하의 자외 영역으로부터 500㎚ 이상의 파장 영역까지의 광범위로 이용 가능하다. A laser device made of a nitride semiconductor of GaN or the like, the oscillation wavelength, is available from the ultraviolet region of less than 370㎚ with a wide range of up to at least 500㎚ wavelength region. 이러한 레이저 소자를 형성하는 기판은, ELOG(Epitaxially Lateral Overgrowth)법으로 불리는 래터럴 성장을 이용하여 형성하고 있는 것이 있다. A substrate for forming such a laser device is, there is one that is formed using a lateral growth called ELOG (Epitaxially Lateral Overgrowth) method. 이 기술은, 주기적인 스트라이프 형상의 개구부를 갖는 SiO 2 마스크 패턴을 형성한 기초 기판 상에, GaN을 래터럴 성장시켜, GaN층을 형성한다. This technique, on the base substrate to form an SiO 2 mask pattern having an opening of a periodic stripe-shaped, so as to grow the lateral GaN, to form a GaN layer. 다음으로, 기초 기판을 제거함으로써, GaN층만으로 이루어지는 기판을 제조한다. By Next, remove the base substrate, to produce a substrate comprising only the GaN layer. 래터럴 성장한 영역의 GaN은, 전위가 낮은 영역으로 된다. The GaN lateral growth area is in a low potential region. 저전위화한 GaN의 결정성은 양호하기 때문에, 이 GaN을 기판으로서 사용하면, 질화물 반도체 레이저 소자의 수명 특성을 향상시킬 수 있다. Since low potential Yu Hua crystal of GaN castle to good, using this GaN as a substrate, it is possible to improve the life characteristics of the nitride semiconductor laser device. 또한, 질화물 반도체 레이저 소자는, 소자 특성의 향상도 요구되고 있다. Further, the nitride semiconductor laser device is improved in the device characteristics have also been required. 그 때문에, 기판은, 기판 자체의 저전위화뿐만 아니라, 양호한 결정성을 갖는 질화물 반도체층을 그 위에 성장시킬 수 있는 것일 필요가 있다. Therefore, the substrate, as well as low potential Yu Hua of the substrate itself, it is probably necessary that the nitride semiconductor layer having a good crystallinity can be grown thereon. 또한, 질화물 반도체 소자를 실용화하기 위해서는, 기판 자체의 대구경화도 필요로 된다. Further, in order to put into practical use a nitride semiconductor device, large diameter of the substrate itself it is also needed. 그 때문에, 육방정계의 질화물계 반도체로 이루어지는 기판에서, (0001)면으로부터 소정의 방향으로 1° 이상 20° 이하에서 오프각을 형성하는 기판이 제안되어 있다(참고 문헌1). For that reason, it is in a substrate made of a nitride-based semiconductor of hexagonal crystal system, the substrate is formed from an off-angle in the 1 ° or less than 20 ° in a predetermined plane direction (0001) has been proposed (Reference 1). 그러나, 이 질화물 반도체 기판은, 오프각의 경사 범위와 오프각의 경사 방향이 광범위하기 때문에, 레이저 소자 내에서의 In, Al 등의 조성, 불순물 등의 분포가 변동된다. However, the nitride semiconductor substrate, since the tilt range of the off angle and the inclination direction of the off-angle ranges, the distribution of such composition, impurities such as In, Al in the laser device is varied. 특히, In을 함유하는 활성층을 구비하고 있는 레이저 소자인 경우에는, 발진 파장에 따라서는, 임계값 전류의 상승을 초래한다. In particular, when the laser device that includes an active layer containing In there, according to the oscillation wavelength, resulting in an increase in the threshold current. 질화물 반도체 레이저 소자는, 이론상, 광범위한 파장대에서 레이저 발진이 가능하게 되지만, 실제로는 조성 분포, 예를 들면, 활성층 내에서의 In 분포를 균일하게 하지 않으면, 이것을 실현할 수 없는 등의 과제가 있다. The nitride semiconductor laser device is, in theory, but enables the laser oscillation in a wide wavelength range, if the practice of chemical composition, for example, to even out the distribution of the In in the active layer, there is a problem such as this can not be realized. 또한, 1인치 이상으로 대구경화한 기판을 제조하는 경우, 이 기판의 주면 상에, 피트 및 홈이 남기 때문에, 기판 상에 형성하는 질화물 반도체층에 따라 그 표면을 평탄화하는 것이 필요로 된다고 하는 과제도 있다. Further, the problem that as it is necessary to flatten the surface thereof according to the nitride semiconductor layer formed on the case, on the principal surface of the substrate, and pits and because of the groove leaving a substrate for producing a substrate with large diameter by more than one inch there is also. 본 발명은 이러한 점을 감안하여 이루어진 것으로, 광범위한 파장대에서, 질화물 반도체층의 조성 분포, 예를 들면, 활성층의 결정성이나 In 함유량을 균일하게 하여, 수명 특성 및 소자 특성이 한층 더 우수한 소자를 제공하는 것을 목적으로 한다. The present invention has been made in view of the above points, in a wide wavelength ranges, the composition of the nitride semiconductor layer is distributed, for example, by a uniform crystalline or the In content of the active layer, it provides a service life characteristics, and the device characteristics are more excellent device and that for the purpose. 본 발명의 제1 질화물 반도체 레이저 소자는, 질화물 반도체 기판의 주면 상에 제1 도전형의 질화물 반도체층과, In을 함유하는 활성층과, 제1 도전형과는 다른 도전형을 한 제2 도전형의 질화물 반도체층과, 상기 제2 도전형의 질화물 반도체층에 스트라이프 형상의 릿지부를 구비하여 이루어지며, 상기 질화물 반도체 기판의 주면은, 기준 결정면에 대하여, 적어도 상기 스트라이프 형상의 릿지부와 대략 평행 방향으로 오프각 a(θ a )를 갖고 있는 것을 특징으로 한다. A first nitride semiconductor laser device of the present invention, the second conductivity type the active layer, a first conductivity type and the other conductivity type containing first nitride semiconductor layer and, In the conductivity type on the principal surface of the nitride semiconductor substrate the nitride becomes the place having a semiconductor layer, the second conductive ridge of stripe in the nitride semiconductor layer portion of a main surface of said nitride semiconductor substrate, with respect to the reference crystal plane, and at least the stripe-shaped ridge portion and substantially parallel to the direction characterized in that a characteristic of the off-angle a (θ a). 또한, 제2 질화물 반도체 레이저 소자는, 질화물 반도체 기판의 주면 상에 제1 도전형의 질화물 반도체층과, 활성층과, 제1 도전형과는 다른 도전형을 한 제2 도전형의 질화물 반도체층과, 상기 제2 도전형의 질화물 반도체층에 스트라이프 형상의 릿지부를 구비하여 이루어지며, 상기 질화물 반도체 기판의 주면은, 기준 결정면에 대하여, 상기 스트라이프 형상의 릿지부에 대략 평행 방향으로 오프각 a(θ a )와, 대략 수직 방향으로 오프각 b(θ b )를 갖고 있는 것을 특징으로 한다. Further, the second nitride semiconductor laser device, a nitride semiconductor layer of the first conductivity type on the principal surface of the nitride semiconductor substrate, an active layer, a first conductivity type and the nitride semiconductor layer of the second conductivity type by a different conductivity type and , made by a nitride semiconductor layer of the second conductivity type comprising a stripe-shaped ridge, the main surface of said nitride semiconductor substrate, with respect to the reference crystal plane, the off substantially in parallel to the ridge of the stripe-shaped angle a (θ a), and it is characterized in that substantially each have a b (θ b) off in the vertical direction. 또한, 본 발명의 질화물 반도체 소자는, 질화물 반도체 기판의 주면 상에 제1 도전형의 질화물 반도체층과, 활성층과, 제1 도전형과는 다른 도전형을 한 제2 도전형의 질화물 반도체층을 순서대로 구비하여 이루어지며, 상기 질화물 반도체 기판의 주면은, M면(1-100)에 대하여 대략 수직 방향으로 오프각 a(θ a ), 대략 평행 방향으로 오프각 b(θ b )를 갖고 있으며, |θ a |>|θ b |의 관계를 만족시키는 것을 특징으로 한다. Further, the nitride semiconductor device of the present invention, a first conductive type nitride semiconductor layer, an active layer and a second nitride semiconductor layer of the conductivity type the other conductivity type is the first conductivity type on the principal surface of the nitride semiconductor substrate is done by having in order, the main surface of said nitride semiconductor substrate, and has a M plane (1-100) in a substantially vertical direction, off angle a (θ a), in the direction substantially parallel to the off angle b (θ b) with respect to the , | characterized by satisfying the relationship | θ a |> | θ b . 이들 소자에서는, (1) 상기 기준 결정면은, (0001)면, (11-20)면 또는 (1-100)면이거나, (2) 상기 질화물 반도체 기판의 주면은, (0001)면으로 이루어지는 제1 영역과, 적어도 제1 영역과 다른 결정 성장면을 갖는 제2 영역을 구비하고 있거나, (3) 상기 제2 영역은, (000-1)면이거나, (4) 상기 질화물 반도체 기판의 주면은, 상기 제1 영역과 상기 제2 영역을 대략 평행하게 갖거나, (5) 제1 영역이, 릿지의 바로 아래에 배치되어 이루어지거나, (6) 0.1°≤|θ a |≤0.7°를 만족하거나, (7) |θ a |>|θ b |를 만족하거나, (8) 제1 도전형의 질화물 반도체층에는, 래터럴 성장시킨 Al을 함유하거나, (9) 제1 영역과 제2 영역은, 스트라이프 형상으로 극성이 분단되어 있거나 중 1종 이상을 구비하는 것이 바람직하다. In these devices, (1) the reference crystal plane is a (0001) plane, or a plane (11-20) plane or (1-100), (2) a main surface of said nitride semiconductor substrate is formed of a first surface (0001) or comprises a first region and at least a first region and a second region having a different crystal growth surface, (3) the second region is (000-1) plane, or, (4) the main surface of said nitride semiconductor substrate is the first region and the second has substantially parallel to the second region, or (5) a first region made or is disposed directly below the ridge, (6) 0.1 ° ≤ | ≤0.7 ° satisfies | θ a or, (7) | θ a | > | θ b | satisfies, or (8) of claim 1, the nitride semiconductor layer of the conductivity type, containing a lateral growth in which Al, or (9) the first region and the second region , a stripe shape is preferably provided with at least one of either polarity is divided. 상기 코어 영역의 최외층과 상기 제1 질화물 반도체층 사이 및 상기 제1 질화물 반도체층과 상기 제2 질화물 반도체층 사이에 굴절율차를 갖는 것이 바람직하다. To have a refractive index difference between the core region of the outermost layer and the first nitride semiconductor layer and between the first nitride semiconductor layer and the second nitride semiconductor layer. 제m(m≥2)의 n형 질화물 반도체층의 굴절율은, 제1 p형 질화물 반도체층의 굴절율보다 높거나, (e) 제m(m≥2)의 n형 질화물 반도체층과 제1 p형 질화물 반도체층의 굴절율차(Δn)는 0.004∼0.03이거나, (f) 제m(m≥2)의 n형 질화물 반도체층과 상기 코어 영역의 최외층의 굴절율차(Δn m )는 0.007∼0.05이거나 중 1종 이상을 구비하는 것이 바람직하다. The refractive index of the n-type nitride semiconductor layer of the m (m≥2) is greater than the refractive index of claim 1 p-type nitride semiconductor layer, or, (e) the m (m≥2) n-type nitride semiconductor layer and a p of 1 refractive index difference (Δn) of the-type nitride semiconductor layer may be a 0.004~0.03, (f) the m n-type nitride semiconductor layer and the core refractive index difference (Δn m) of the outermost layer of the region of the (m≥2) is 0.007 to 0.05 or preferably it has at least one kind of. 본 발명의 질화물 반도체 레이저 소자 및 질화물 반도체 소자(양자를 포함하여 간단하게 「소자」라고 하는 경우가 있음)는, 질화물 반도체 기판(간단하게 「기판」이라고 하는 경우가 있음)의 제1 주면 상에 제1 도전형의 질화물 반도체층(간단하게 「반도체층」이라고 하는 경우가 있음)과, 활성층과, 제2 도전형(제1 도전형과는 다른 도전형)의 질화물 반도체층을 이 순서로 구비한다. The nitride semiconductor laser device and a nitride semiconductor device of the present invention (in the case of simply including both called "elements") are, on the first main surface of the (in the case of simply as "substrate"), the nitride semiconductor substrate Article comprising a (is in the case, known as simply "the semiconductor layer"), and the active layer and the nitride semiconductor layer of the second conductivity type (the first conductivity type and the other conductivity type) first conductivity type nitride semiconductor layer in this order do. 또한, 질화물 반도체 소자는, 레이저 소자이어도 되고, LED이어도 된다. Further, the nitride semiconductor device, may be a laser device may be a LED. 특히, 레이저 소자의 경우에는, 제2 도전형의 질화물 반도체층에 스트라이프 형상의 릿지부를 갖고 있는 것이 바람직하다. In particular, in the case of the laser element, it is preferable to have parts of the stripe ridge of the nitride semiconductor layer of the second conductivity type. 이 소자는, 제2 도전형의 질화물 반도체층 상에 제2 전극을 구비하고, 기판의 제2 주면(제1 주면과 대향하는 주면)에 제1 전극을 구비한 대향 전극 구조로 할 수 있다. The device, it is possible to the opposing electrode structure having a second electrode on the second conductive type nitride semiconductor layer, a first electrode on the second main surface (main surface opposite the first major surface) of the substrate. 이 구조에 의해, 제조 공정을 안정화하고, 대전류를 투입하는 것이 가능해져, 고출력 발진을 할 수 있는 고품질의 소자를 수율 좋게 실현할 수 있다. With this structure, it is possible to stabilize the manufacturing process, In a large current, it is possible to realize a high-quality device which can execute a high-power oscillation good yield. 또한, 제1 주면측에, 제1 및 제2 전극의 쌍방이 배치되어 있어도 된다. Further, the first main surface side, or may have the first and both the second electrodes are arranged. 이하에, 본 발명의 질화물 반도체 레이저 소자를, 그 제조 방법과 함께 설명한다. In the following, a nitride semiconductor laser device of the present invention will be described along with a method of manufacturing the same. 이 소자는, 도 1의 (b) 및 도 2의 (a)에 도시한 바와 같이, 질화물 반도체 기판(101) 상에, 제1 도전형 질화물 반도체층, 활성층, 제2 도전형 질화물 반도체가 이 순서로 형성되어 있고, 제2 도전형 질화물 반도체층의 표면에는 스트라이프 형상의 릿지부가 형성되어 있다. The device, as shown in Fig. (B) and 2 (a) of Figure 1, on a nitride semiconductor substrate 101, a first conductive type nitride semiconductor layer, an active layer, a second conductive type nitride semiconductor is are formed in this order, it may include the portion is formed of a stripe-like ridge surfaces of the second conductive type nitride semiconductor layer. 기판(101)의 주면은, 도 1의 (a), 도 3의 (a) 및 (b)에 도시한 바와 같이 릿 지부와 대략 평행 방향 A, 예를 들면,  방향 및 [1-100] 방향으로부터 오프각 a(θa°) 기울어져 있다. The main surface of the substrate 101, also of 1 (a), substantially parallel with droplets portion as shown in (a) and (b) of FIG. 3 A, for example,  direction and [1- 100] off angle a (θa °) from the direction inclined. 즉, 기판의 주면이란, 기판의 소정의 기준 결정면(오프각의 경사가 없는 면, 예를 들면, C면)에 대하여, 오프각 a를 갖는 면을 가리킨다. That is, with respect to the main surface is, a predetermined reference crystal plane of the substrate of the substrate (the side without the inclination of the off angle, for example, C plane), refers to a surface having the off-angle. 또한, 기판의 주면은, 도 4의 (a) 및 (b)에 도시한 바와 같이 소정의 기준 결정면에 대하여, 릿지부와 대략 평행 방향 A로 오프각 a 기우는 것에 외에, 또한, 오리프러(OF)면에 대하여 대략 수직 방향, 예를 들면, [11-20] 방향으로, 오프각 b(θ b °) 기울어져 있어도 된다. Further, with respect to the major surface, a predetermined reference crystal plane as shown in (a) and (b) of Fig. 4 of the substrate, in addition to the ridge portion and is substantially parallel to the off angle a slant to the direction A, also, duck peureo ( oF) substantially perpendicular direction to the surface, for example, the [11-20] direction, or may tilt off angle b (θ b °). 여기서, 기준 결정면이란, 예를 들면, C면, M면, A면, R면 등의 결정면을 나타낸다. Here, the reference crystal plane is, for example, represents the crystal plane such as C plane, M plane, A plane, R plane. 그 중에서도, C면(0001), M면(1-100), A면(11-20) 등이 바람직하다. Of these, such as C-plane (0001), M plane (1-100), A plane (11-20) is preferred. 「오프각」이란, 기판 표면에 형성된, 소정의 기준 결정면에 대한 경사각이다. "Off-angle" means the inclination angle to the predetermined reference crystal plane formed in the substrate surface. 오프각은, 적어도 스트라이프 형상의 릿지부와 대략 평행 방향으로 형성되는(오프각 a) 것이 바람직하고, 또한, 오프각 a가 형성되는 방향에 대하여 직교하는 방향으로 형성되는(오프각 b) 것이 바람직하다. The off angle is preferably at least the stripe-shaped ridge portion and the (off angle a) is formed in a direction approximately parallel to (off angle b) is preferred, and also, in a direction perpendicular to the off-direction angle a is formed Do. 「대략 평행 방향으로 형성된다」는 것은, 예를 들면, 공진면의 광 출사면 방향으로 하강하도록 형성되거나, 공진면의 광 반사면 방향으로 하강하도록 형성되어 있거나, 혹은, M면(1-100)에 대하여 대략 수직 방향으로 형성되는 것을 포함한다. "It is formed in a direction substantially parallel" it is, for example, be formed so as to fall in the light exit plane of the resonator surface, or is formed so as to fall as light reflecting surfaces of the resonance surface direction, or, M plane (1-100 ) it includes those formed in an approximately vertical direction with respect to the. 이에 의해, 릿지부의 바로 아래에 위치하는 활성층의 표면 모폴로지 및 조성(예를 들면, In 혼정비)을 균일하게 할 수 있다. In a way, the surface morphology and composition of the active layer located directly below the ridge portion (e.g., In mixing ratio) can be made uniform. 오프각 a는, 절대값 |θ a |가 0.02°∼5° 정도, 0.1°∼0.7° 정도, 또한 0.15°∼0.6° 정도, 0.1°∼0.5° 정도, 0.15°∼0.4° 정도, 0.2°∼0.3° 정도인 것이 바람직하다. The off angle a is, the absolute value | θ a | is about 0.02 ° ~5 °, 0.1 ° ~0.7 ° degree, also about 0.15 ° ~0.6 °, 0.1 ° ~0.5 ° approximately, 0.15 ° ~0.4 ° approximately, 0.2 ° that the ~0.3 ° degree is preferred. 오프각 b는, 절대값 |θ b |가, 0°보다 대, 0°∼0.7° 정도, 0°∼0.5° 정도, 0°∼0.5° 미만, 0°∼0.3° 정도인 것이 바람직하다. Off angle b is, the absolute value | it is preferred that, for more than 0 °, of about 0 ° ~0.7 ° degree, 0 ° ~0.5 ° degree, less than 0 ° ~0.5 °, 0 ° ~0.3 ° | θ b. 기판이 오프각 a 및 b를 갖는 경우에는, |θ a |>|θ b |인 것이 바람직하다. When having each a and b the substrate is off, | θ a |> | is preferably | θ b. 이에 의해, 기판의 주면 상에 성장하는 반도체층의 표면 모폴로지가 면 내에서 평탄화된다. As a result, the surface morphology of the semiconductor layer grown on the main surface of the substrate is flattened in a plane. 또한, 반도체층 내의 Al이나 In 등의 조성 분포를 보다 균일화할 수 있다. Further, it is possible to more uniform chemical composition, such as Al or In in the semiconductor layer. 특히, 종래 기판에서는 곤란하였던, 활성층에서의 In 조성이 5%를 초과하는 반도체층에서도 조성 분포를 균일화할 수 있다. In particular, in the conventional substrate it can be made uniform a composition distribution in the semiconductor layer in which the In composition of the who, an active layer is difficult to exceed 5%. 즉, 상술한 바와 같은 오프각이 형성되어 있으면, 파장이 365㎚ 이하인 자외 영역으로부터 500㎚ 이상인 장파장 영역에 이르는 범위에서 소자 특성을 향상시킬 수 있다. That is, if the off-angle as described above is formed, it is possible to improve device characteristics at a wavelength range from a long wavelength region from not less than 500㎚ 365㎚ than the ultraviolet region. 마이크로 PL로 릿지 또는 칩 내를 관찰하였을 때에, 오프각을 갖지 않는 기판 상에 성장시킨 반도체층 내의 활성층의 In의 조성 불균일은 큰(도 5) 것에 대하여, 상술한 오프각을 갖는 기판을 이용한 경우에는, 활성층의 In 조성의 불균일을 억제할 수 있다(도 6). Time was observed within the ridge or the chip to the micro PL, the composition non-uniformity of the in which the active layer in the semiconductor layer grown on a substrate having no off-angle In the case with respect to large (FIG. 5), using the substrate having the above-described off-angle there, it is possible to suppress the unevenness of the in composition of the active layer (6). 반도체층은, 제1 도전형(예를 들면, n형) 반도체층과 제2 도전형(예를 들면, p형) 반도체층에서, 활성층을 사이에 두고 분리 광폐쇄형 구조(Separate Confinement Heterostructure)이다. The semiconductor layer has a first conductivity type (for example, n-type) semiconductor layer and a second conductivity type (for example, p-type) in the semiconductor layer, with split optical closed-type structure between the active layer (Separate Confinement Heterostructure) to be. 활성층은, In을 함유하는 것이 바람직하다. The active layer, preferably containing In. 이에 의해, 광범위한 파장대의 소자를 실현할 수 있다. This ensures to realize a device of a wide wavelength band. 또한, 다중 또는 단일 양자 웰 구조 중 어느 것이라도 된다. In addition, any of multiple or single quantum well structure would also. 양자 웰 구조로 함으로써, 발광 효율을 향상시킬 수 있다. By a quantum well structure, it is possible to improve the luminous efficiency. 활성층보다 밴드 갭이 큰 반도체층을, 활성층의 상하에 구비함으로써, 광의 도파로가 구성된다. The semiconductor layer is greater than the band gap of the active layer, by having the top and bottom of the active layer, the light waveguide is configured. 또한, 활성층의 양측에 클래드층(굴절율이 낮은 층)을 형성함으로써, 광 및 캐리어의 쌍방을 폐쇄할 수 있다. In addition, it can be closed by forming a cladding layer (layer of low refractive index) on either side of the active layer, light and carrier both the. 오프각을 갖는 질화물 반도체 기판은, 이하와 같이 형성할 수 있다. The nitride semiconductor substrate having an off angle can be formed as follows. 우선, 도 7의 (a)에 도시한 바와 같이 질화물 반도체와 다른 재료로 이루어지는 이종 기판(10)을 준비한다. First, preparing the auxiliary substrate 10 is made of a nitride semiconductor and another material as shown in Fig. 7 (a). 이종 기판은, 사파이어, GaAs, SiC, Si, 첨정석, SiO 2 , SiN, ZnO 등을 들 수 있다. Auxiliary substrate is, there may be mentioned sapphire, GaAs, SiC, Si, spinel, SiO 2, SiN, ZnO and the like. 이종 기판(10)의 표면은, 후에 성장시키는 질화물 반도체의 성장면을 (0001)면, (11-20)면 또는 (1-100)면으로 하는 것이 바람직하다. The surface of the auxiliary substrate 10, to the surface of the growth surface of the nitride semiconductor to be grown (0001), (11-20) plane or (1-100) plane is preferred after. 이종 기판(10)의 표면 상에, Al x Ga 1-x N(0≤x≤1)으로 이루어지는 버퍼층(도시 생략)을 성장시킨다. On the surface of the auxiliary substrate 10, to grow a buffer layer (not shown) made of Al x Ga 1-x N ( 0≤x≤1). 버퍼층은, 900℃ 이하의 성장 온도에서, 예를 들면, MOCVD법에 의해, 감압∼대기압에서 성장시킨다. Buffer layer is grown at a temperature not higher than 900 ℃, for example, by the MOCVD method, the growth in the reduced pressure-atmospheric pressure. 본 발명에서는, 반도체층은, 예를 들면, 유기 금속 화학 기상 성장(MOCVD)법, 할로겐 기상 에피택셜 성장(HVPE)법, 분자선에피택시(MBE)법 등의 기상 성장법, 질화물 반도체를 성장시키는 데 알려져 있는 모든 방법을 이용하여 형성할 수 있다. According to the present invention, the semiconductor layer is, for example, organic metal chemical vapor deposition (MOCVD) method, the halogen vapor phase epitaxial growth (HVPE) method, a gas phase, such as molecular beam epitaxy (MBE) method deposition method, growing the nitride semiconductor used it can be formed by using any method that is known. 그 후, 도 7의 (b)에 도시한 바와 같이, 예를 들면, 버퍼층을 개재하여 이종 기판(10) 표면에 볼록부(10a)를 형성한다. Then, as shown in (b) of Fig. 7, for example, via the buffer layer forms a convex portion (10a) on the surface of the dissimilar substrate 10. 계속해서, 전위를 저감시킨 질화물 반도체층(100)을 성장시킨다. Then, to grow a nitride semiconductor layer 100 having reduced dislocation. 이 반도체층(100)의 막 두께는 50㎛∼10㎜ 정도, 바람직하게는 100㎛∼1000㎛ 정도이다. The film thickness of the semiconductor layer 100 is on the order of 100㎛~1000㎛ 50㎛~10㎜ is the degree, preferably. 이 범위이면, 후 공정에서의 오프각의 형성 및 핸들링을 용이하게 할 수 있다. Within this range, the off-angle formed, and handling in the subsequent step can be facilitated. 계속해서, 도 7의 (c)에 도시한 바와 같이 이종 기판을 연마, 연삭, 전자파 조사(엑시머 레이저-조사 등) 또는 CMP 등에 의해 제거하여, 단체의 질화물 반도체층(100)을 추출함으로써, 질화물 반도체 기판을 얻는다. Next, a polishing, grinding, electromagnetic irradiation the substrate of different material, as shown in (c) of Figure 7 by extracting (excimer laser radiation etc.) or to remove by CMP, a group nitride semiconductor layer 100, the nitride to obtain a semiconductor substrate. 이 기판은, 반도체층(100)의 성장면을 제1 주면, 이종 기판(10)을 제거함에 따른 노출면을 제2 주면으로 한다. The substrate has a first main surface of the growth surface of the semiconductor layer 100, and an exposed surface of the removal of the auxiliary substrate 10 in the second main surface. 또한, 이종 기판은, 반드시 여기서 제거하는 것은 필요한 것은 아니다. In addition, the substrate of different material is to be removed where it is not required. 후술하는 n 전극의 형성까지 제거해도 되고, 제거하지 않아도 된다. And, removing up to the formation of the n-electrode described below, need not be removed. 얻어진 질화물 반도체 기판의 제1 표면은, 예를 들면, (0001)면, (11-20)면, (1-100)면(M면) 등을 포함하는 것이 바람직하다. The first surface of the nitride semiconductor substrate thus obtained is, for example, to include (0001) plane, (11-20) plane, (1-100) plane (M plane) are preferred. 이에 의해, 기판과 질화물 반도체층의 계면으로부터 발생하는 전위를 저감시킬 수 있다. This makes it possible to reduce the potential generated from the interface between the substrate and the nitride semiconductor layer. 또한, 웨이퍼로부터 분할하는 공정에서의 벽개 등을 재현성 좋게 행할 수 있다. In addition, the cleavage can be carried out with good reproducibility, such as in the process of division from the wafer. 기판의 제1 표면에는, 전위가 면 내에서 주기적으로 분포하고 있는 것이어도 된다. A first surface of the substrate, if the dislocation It may be that are periodically distributed within. 예를 들면, ELO법을 이용하여 저전위 밀도 영역(예를 들면, 제1 영역)과 고전위 밀도 영역(예를 들면, 제2 영역)을 교대로 스트라이프 형상으로 형성한 것을 들 수 있다. For example, there may be mentioned the one using the ELO method forming a low dislocation density region by a stripe-shaped (e. G., The first area) and the high-potential-density region (e. G., The second area) alternately. 이에 의해, 기판 내의 응력을 완화시킬 수 있어, 기판 상에 응력 완화층을 형성하지 않고, 그 위에 질화물 반도체층을 성장시킬 수 있다. As a result, it is possible to alleviate a stress in the substrate, without forming a stress relieving layer on the substrate, it is possible to grow a nitride semiconductor layer thereon. 또한, 제1 영역과 제2 영역은 스트라이프 형상으로 극성이 분단되어 있는 것이 바람직하다. In addition, the first region and the second region it is preferable that the polarity is divided into stripe-shaped. 이에 의해, 기판에 발생하는 응력이나 왜곡을 억제할 수 있다. This makes it possible to suppress the stress and the distortion generated in the substrates. 또한, 웨이퍼의 분할 공정에서의 벽개 등을 재현성 좋게 행할 수 있다. In addition, the cleavage can be carried out with good reproducibility, such as in the separation step of the wafer. 여기서, 저전위 밀도 영역이란, 단위 면적당의 전위수가 1×10 7 /㎠ 이하, 바람직하게는 1×10 6 /㎠ 이하, 더 바람직하게는 5×10 5 /㎠ 이하인 영역이다. Here, the low dislocation density region is, the number of dislocation per unit area of 1 × 10 7 / ㎠ or less, preferably not more than 1 × 10 6 / ㎠ or less, more preferably 5 × 10 5 / ㎠ area. 고전위 밀도 영역이란, 저전위 밀도 영역보다 전위 밀도가 높은 영역이면 된다. The high-potential-density region is, if the dislocation density is high density region than the low-potential areas. 제1 영역과 제2 영역이 교대로 스트라이프를 형성하는 경우, 제1 영역의 폭은 10㎛∼500㎛, 또한 100㎛∼500㎛가 바람직하다. The first region and the second region if this forms a stripe in turn, the width of the first region is preferably 10㎛~500㎛, also 100㎛~500㎛. 제2 영역의 폭은 2㎛∼100㎛, 10㎛∼50㎛가 바람직하다. The width of the second region is preferably 2㎛~100㎛, 10㎛~50㎛. 이들의 전위 측정은 CL 관찰이나 TEM 관찰 등으로 행할 수 있다. These potential measurements can be carried out by CL observation or TEM observation and the like. 예를 들면, 제1 표면 상에 형성되는 저전위 밀도 영역을 (0001)면으로 하면, 고전위 밀도 영역은 (0001)면과는 다른 (000-1)면, (11-20)면, (10-14)면, (10-15)면, (11-24)면 등의 결정 성장면을 들 수 있다. For example, the surface 1 when a low dislocation density region formed on the surface of the plane (0001), the high-potential-density region is a (0001) plane is different from (000-1) plane, (11-20), ( 10 to 14), and the crystal growth surface such as a surface, (10-15) plane, (11-24) plane. 특히, (000-1)면이 바람직하다. In particular, with the side (000-1) is preferred. 이와 같이 부분적으로 결정 성장면이 서로 다른 면을 갖는 기판을 이용함으로써, 기판 내부에 발생하는 응력이나 왜곡을 완화시킬 수 있어, 기판 상에 응력 완화층을 형성하지 않고, 반도체층을 막 두께 5㎛ 이상으로 적층하는 것이 가능하게 된다. Thus, in part determined by using a substrate having a different plane growth surface, it is possible to alleviate the stress and the distortion generated in the substrate, without forming a stress relieving layer on the substrate, a semiconductor layer thickness 5㎛ to over stacked is possible. 즉, 웨이퍼의 휘어짐 및 크랙의 발생을 저감할 수 있다. That is, it is possible to reduce the occurrence of warping and cracking of the wafer. 상술한 스트라이프 형상은, 파선 형상으로 형성되어 있는 것을 포함한다. The above-described stripe shape, including those which are formed by a broken line shape. 또한, 질화물 반도체의 제2 표면은, 적어도 2 이상의 서로 다른 결정 성장면 을 갖는 것이 바람직하고, 구체적으로는 (000-1)면, (0001)면, (11-20)면, (10-15)면, (10-14)면, (11-24)면 등을 들 수 있다. In addition, the second surface of the nitride semiconductor, the side face Specifically, (0001) (000-1) may have a surface at least two different crystal growth, and, (11-20) plane, (10-15 ) plane, (10-14), and the surface, (11-24) plane or the like. 본 명세서에서는, 면 지수를 나타내는 괄호 내의 바(-)는, 뒤의 숫자 위에 붙이는 것으로 한다. In the present specification, the bar in the parentheses represents the surface index (-), the number by attaching on the back. 또한, 기판의 외주 형상은 특별히 한정되지 않고, 웨이퍼 형상이어도, 사각 형상 등이어도 된다. Further, the outer shape of the substrate is not particularly limited, and may be may be a wafer shape, such as rectangular shape. 웨이퍼 형상인 경우에는, 1인치 이상, 또한 2인치 이상의 사이즈가 바람직하다. If the wafer shape, more than one inch, are also preferred the size is more than 2 inches. 기판은, 2축 결정법에 의한 (0002) 회절 X선 로킹 커브의 반치폭(Full Width at Half Maximum)이 2분 이하인 것이 바람직하고, 1분 이하가 보다 바람직하다. Substrate, it is (0002) diffracted X-ray rocking curve full width at half maximum of the (Full Width at Half Maximum) is not more than half a biaxial Determination is preferred, more preferably less than one minute. 또한, 질화물 반도체 기판으로서는, Ⅲ족 원소(B, Ga, Al, In 등)와 질소의 화합물 또는 혼정 화합물(GaN, AlN, AlGaN, InAlGaN 등)을 들 수 있다. 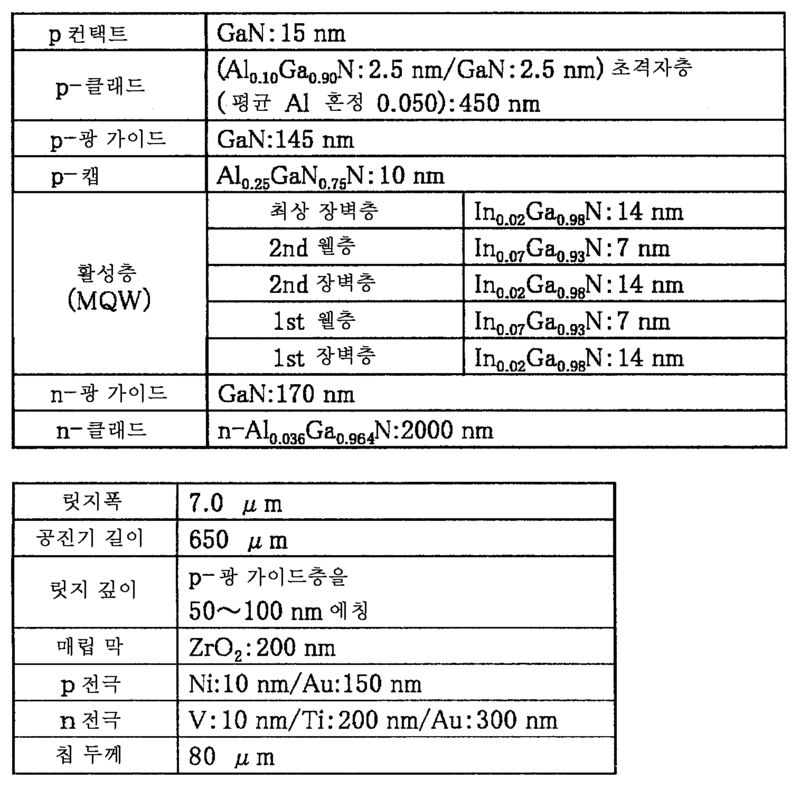 In addition, there may be mentioned as the nitride semiconductor substrate, Ⅲ group elements (B, Ga, Al, In, etc.) or a mixed crystal compound and a compound of nitrogen (GaN, AlN, AlGaN, InAlGaN, etc.). 또한, 이 기판은, n형 또는 p형 불순물을 함유하는 것이 바람직하다. In addition, the substrate preferably contains a n-type or p-type impurity. 이 불순물 농도는, 1×10 17 ㎝ -3 ∼1×10 20 ㎝ -3 을 들 수 있다. The impurity concentration is, there may be mentioned 1 × 10 17 ㎝ -3 ~1 × 10 20 ㎝ -3. 이 기판은, 부분적으로 사파이어 등의 절연성 기판을 갖는 것이어도 된다. This substrate, It may be in part with an insulating substrate of sapphire or the like. 질화물 반도체 기판은, 상술한 2단 성장의 ELO법, 선택 성장법 등을 이용하여 형성해도 되고, 초임계 유체 내에서 결정 육성시키는 수열 합성법, 고압법, 플럭스법, 용융법 등으로 형성되는 벌크 단결정을 이용해도 된다. The nitride semiconductor substrate, may be formed by using a ELO method, a selective growth method of the above-described two-stage growth, supercritical fluid hydrothermal synthesis of crystal growth in the, high pressure method, a flux method, a bulk single crystal is formed in a melting method, etc. It may also be used. 또한, 시판품을 이용해도 된다. Further, it is also possible to use a commercially available product. 다음으로, 도 7의 (d)에 도시한 바와 같이, 얻어진 기판(101)의 표면에 오프각을 형성한다. Next, as shown in (d) of Figure 7, to form an off-angle to the surface of the resulting substrate 101. 오프각은, 기판(101)의 제1 표면에 막 두께 분포를 갖는 마스크( 도시 생략)를 형성하고, 그 후, 마스크를 에칭에 의해 제거하며, 또한 노출된 기판의 제1 표면도 계속해서 에칭한다. The off angle, forming a mask (not shown) having a film thickness distribution on the first surface of the substrate 101, and then, removal of the mask for etching, and also the first surface continues to etch the exposed substrate do. 에칭은, 웨트 에칭, 드라이 에칭(반응성 이온 에칭: RIE, 반응성 이온 빔 에칭: RIBE, 전자 사이클로트론 공명: ECR, 고주파 유도 결합 플라즈마: ICP, 수속 이온 빔: FIB 등), CMP 처리 등에 의해 행할 수 있다. Etching, wet etching, dry etching can be carried out by (reactive ion etching: RIE, reactive ion beam etching: RIBE, electron cyclotron resonance: ECR, high frequency inductively coupled plasma:: ICP, converged ion beam FIB, etc. ), CMP processing . 그 중에서도, 드라이 에칭법을 이용하는 것이, 오프각을 용이하게 제어할 수 있기 때문에 바람직하다. Among them, to use a dry etching method, it is preferable because it can easily control the off angle. 이에 의해, 기판의 제1 표면에는, 에칭 시간에 면내 분포가 발생하기 때문에, 원하는 오프각을, 원하는 방향에 대하여, 원하는 크기로 형성할 수 있다. In this way, the first surface of the substrate, since the in-plane distribution occurs in the etching time, the desired off-angle, with respect to the desired direction, it is possible to form the desired size. 혹은, 기판의 제1 표면을, 연마하고, 연삭하는, 레이저 조사에 의해 표면 처리하는 방법 등을 이용해도 되고, 벌크의 질화물 반도체 기판을 와이어 소우로 오프각을 갖도록 잘라내어도 된다. Or, it may be cut and the first surface of the substrate, and polishing, by grinding, laser irradiation is also possible to use a method of surface treatment, to have the off-angle in a wire-and-sew the bulk of the nitride semiconductor substrate. 특히, 드라이 에칭에 의해 오프각을 형성하는 경우에는, 드라이 에칭 장치에 기판을 기울어지게 하여 세트하거나, 경사가 있는 기판 홀더에 기판을 세트하여, 에칭을 하는 방법이어도 된다. In particular, when the off angle formed by a dry etching, set by tilting the substrate to a dry etching device, or to set the substrate to the substrate holder with a slope, may be a method for the etching. 또한, 사전에 이종 기판에 오프각을 형성하고, 그 위에 질화물 반도체층을 성장시킴으로써 이종 기판으로부터 질화물 반도체층에 오프각을 연속시켜, 이 질화물 반도체층으로부터 기판을 얻어도 된다. Further, prior to forming the off-angle on the substrate of different material, by the over growth of the nitride semiconductor layer by a continuous off-angle in the nitride semiconductor layer from a foreign substrate, the substrate may be obtained from the nitride semiconductor layer. 얻어진 기판(101)의 제1 주면은, 질화물 반도체 기판의 본래의 표면에 대하여 오프각 a를 갖는다. The first major surface of the resulting substrate 101 has an off angle a with respect to the original surface of the nitride semiconductor substrate. 이것을 이용하여 소자를 형성함으로써, 기판 상에 성장시킨 반도체층 내에서는, 응력이 억제되어, 벽개 시에 있어서의 손상에 견디는 것이 가능하게 된다. By forming a device using this, in the semiconductor layer grown on the substrate, the stress is suppressed, it is possible to withstand the damage at the time of cleavage. 다음으로, 도 8의 (a)에 도시한 바와 같이 오프각을 갖는 기판(101)의 제1 주면 상에, 하층(생략 가능한 크랙 방지층 등)을 개재하여, 질화물 반도체층(200)으로서, 예를 들면, n측 층, 활성층, p측 층을 이 순서로 적층한다. Next, as the first major surface to the upper and the nitride semiconductor layer 200 via the lower layer (optional crack-preventing layer, etc.) of the substrate 101 having an off angle as shown in FIG. 8 (a), for example, for example, the laminated n-type layer, active layer, p-side layer in this order. 반도체층(200)은, In x Al y Ga 1-xy N(0≤x≤1, 0≤y≤1, 0≤x+y≤1) 등을 들 수 있다. Semiconductor layer 200, and the like In x Al y Ga 1-xy N (0≤x≤1, 0≤y≤1, 0≤x + y≤1). 우선, n측 층으로서, n측 클래드층: n형 불순물 도핑 Al x Ga 1-x N(0≤x≤0.5), n측 광 가이드층: Al x Ga 1-x N(0≤x≤0.3)을 성장시킨다. 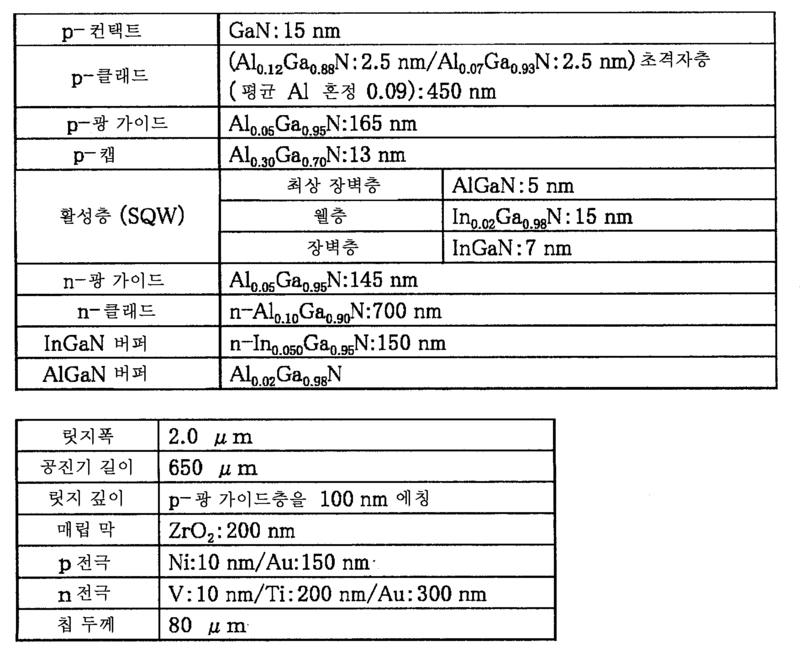 First, as the n-layer, an n-cladding layer: n-type impurity doped Al x Ga 1-x N ( 0≤x≤0.5), n -type optical guide layer: Al x Ga 1-x N (0≤x≤0.3 ) to be grown. 또한, 클래드층 및 광 가이드층 등이라는 명칭은, 반드시 그 기능만을 갖는 것을 의미하는 것이 아니라, 그 밖의 기능도 완수하는 것을 의미한다(p측 층도 동일함). Also, the name of such a clad layer and an optical guide layer is not necessarily mean to imply that it has only the function, also fulfill other functions (the same p-type layer). n측 클래드층은 단일층이면, 일반식은 Al x Ga 1-x N(0≤x≤0.2)이고, 막 두께는 0.5∼5㎛인 것이 바람직하다. The n-side cladding layer is a single layer, and the general formula Al x Ga 1-x N ( 0≤x≤0.2), it is preferable that the film thickness is 0.5~5㎛. 다층이면, 제1 층: Al x Ga 1-x N(0≤x≤0.5, 0≤x≤0.1, 또한 0<x≤0.3이 바람직함)과 제2 층: Al y Ga 1-y (0.01≤y≤1)의 적층 구조로 해도 된다. If multi-layer, the first layer: Al x Ga 1-x N (0≤x≤0.5, 0≤x≤0.1, and 0 <x≤0.3 also are preferred) and the second layer: Al y Ga 1-y ( 0.01 It may be a laminated structure of ≤y≤1). n측 층, 특히, 다층인 경우의 제1 층(Al을 함유하는 반도체층)은, 래터럴 성장시켜 형성하는 것이 바람직하다. an n-layer, in particular, the first layer in the case of a multi-layer (semiconductor layer containing Al) is preferably formed by growing, lateral. 이에 의해, 반도체층의 표면의 한층 더한 평탄화, 반도체층 내에서의 조성 불균일의 억제를 실현할 수 있다. This ensures to realize the suppression of non-uniformity of composition within plus further flattening of the surface of the semiconductor layer, the semiconductor layer. 래터럴 성장은, 로 내에서의 성장 온도를 1000℃ 이상, 압력을 600Torr 이하로 하는 것이 바람직하다. Lateral growth, the growth temperature of more than 1000 ℃ within, as it is preferable that a pressure of 600Torr or less. 다층인 경우의 제1 및 제2 층 등은, 예를 들면, 0.5∼5㎛의 막 두께가 적당하다. The first and second layers in the case of a multi-layer such as, for example, is appropriate that the film thickness of 0.5~5㎛. 다음으로, 활성층으로서, 일반식 In x Al y Ga 1-xy N(0<x≤1, 0≤y<1, 0<x+y≤1)으 로 표시되는 다중 양자 웰 구조의 반도체층을 성장시키는 것이 바람직하다. Next, as an active layer, a formula semiconductor layer having multi quantum well structure represented by In x Al y Ga 1-xy N (0 <x≤1, 0≤y <1, 0 <x + y≤1) coming growth it is preferable to. 웰층의 조성은 In의 혼정이 0<x≤0.5인 것이 바람직하다. The composition of the well layer is preferably in the mixed crystal of In 0 <x≤0.5. 웰층 및 장벽층의 막 두께는, 예를 들면, 10∼300Å, 20∼300Å를 들 수 있고, 총 막 두께는, 예를 들면, 100∼3000Å 정도가 적당하다. The film thickness of the well layer and the barrier layer, for example, there may be mentioned the 10~300Å, 20~300Å, the total thickness of, for example, the degree 100~3000Å ​​is suitable. 또한, 총 막 두께를 10∼300Å 정도의 범위로 함으로써, V f , 임계값 전류 밀도를 저감시킬 수 있다. In addition, it is possible to reduce a, V f, the threshold current density by making the total film thickness in the range of about 10~300Å. 또한, Al 함유량을 조정함으로써 자외 영역의 발광으로부터, 장파장측의 발광(예를 들면, 300㎚∼650㎚, 또한 360㎚∼580㎚)이 가능하게 된다. Further, from the light of ultraviolet region by adjusting the Al content, light emission of long wavelength side (for example, 300㎚~650㎚, also 360㎚~580㎚) it is made possible. 다중 양자 웰 구조는, 장벽층으로부터 시작하여 웰층에서 종료되어도, 장벽층으로부터 시작되어 장벽층에서 종료되어도, 웰층으로부터 시작되어 장벽층에서 종료되어도, 웰층으로부터 시작되어 웰층에서 종료되어도 된다. A multiple quantum well structure, even when starting from a barrier layer ends at the well layer, starting from the barrier layer may be terminated in the barrier layer, the well layer may be started from the end on the barrier layer, starting from a well layer may be terminated in a well layer. 바람직하게는, 장벽층으로부터 시작하여, 웰층과 장벽층의 페어를 2∼8회 반복하여 이루어지는 것으로써, 장벽층에서 종료되는 구성이다. Preferably, the configuration in which, starting from the barrier layer, to be formed by writing a pair of the well layer and the barrier layer repeated 2-8 times, ends at the barrier layer. 특히 이 페어가 2∼3회 반복되어 이루어지는 것은, 임계값을 저하시켜, 수명 특성을 향상시키는 데 바람직하다. In particular, it is made of a pair are repeated two or three times, it is desirable to lowering the threshold value, improving the life characteristics. 계속해서, p측 층으로서, 전자 폐쇄층(생략 가능): p형 불순물 도핑 Al x Ga 1-x N(0≤x≤0.5), p측 광 가이드층: Al x Ga 1-x N(0≤x≤0.3), p측 클래드층: p형 불순물 도핑 Al x Ga 1-x N(0≤x≤0.5), p측 컨택트층: p형 불순물 도핑 Al x Ga 1-x N(0≤x≤1)을 이 순서로 성장시킨다. Subsequently, a p-layer, an electron closure layer (optional): p-type impurity doped Al x Ga 1-x N ( 0≤x≤0.5), p -type optical guide layer: Al x Ga 1-x N (0 ≤x≤0.3), p-cladding layer: p-type impurity doped Al x Ga 1-x N ( 0≤x≤0.5), p -side contact layer: p-type impurity doped Al x Ga 1-x N ( 0≤x to grow a ≤1) in this order. 이들 반도체층에는, In을 혼정시켜도 된다. In these semiconductor layers, it may be a mixed crystal of In. 각 층의 막 두께는 30Å∼5㎛ 정도를 들 수 있다. The film thickness of each layer can be given a degree 30Å~5㎛. 반도체층(200)은, 기판(101)의 제1 주면 상에, 저온 성장 버퍼층: Al x Ga 1-x N(0≤x≤0.3), 중간층(202): Al x Ga 1-x N(0≤x≤0.3) 및/또는 크랙 방지층: In x Al y Ga 1-xy N(0<x≤1, 0≤y<1, 0<x+y≤1)을 개재하여 n측 층을 성장시킨 구성이어도 된다. Semiconductor layer 200, on the first main surface of the substrate 101, a low-temperature growth buffer layer: Al x Ga 1-x N (0≤x≤0.3), intermediate layer (202): Al x Ga 1 -x N ( 0≤x≤0.3) and / or a crack prevention layer: growing an n-layer via an in x Al y Ga 1-xy n (0 <x≤1, 0≤y <1, 0 <x + y≤1) it may be that configuration. 또한, 각 층의 사이에 응력 완충층을 갖는 구조 또는 GRIN 구조를 이용해도 된다. Further, it is also possible to use a structure or a GRIN structure with a stress buffer layer between the respective layers. 중간층 등은, 단일 또는 다층 적층 구조 중 어느 것이라도 된다. The intermediate layer and the like, which would also be of the single or multi-layer stack structure. 이 중간층 등에 의해, 반도체층의 표면 상에 발생하는 전위(관통 전위 등), 피트를 저감시킬 수 있다. By the intermediate layer, it is possible to reduce the potential generated on the surface of the semiconductor layer (threading dislocations, etc. ), foot. n측 클래드층, p측 클래드층은, 단일층 구조, 2층 구조 또는 조성비가 상호 다른 2층으로 이루어지는 초격자(SL) 구조이어도 된다. n-type cladding layer, p-side cladding layer may be a single-layer structure, a two-layer structure or composition ratio is mutually super lattice (SL) structure composed of a different second layer. n측 및 p측 클래드층의 총 막 두께는, 0.4∼10㎛인 것이 바람직하다. n-side and p-side cladding layer of the total film thickness is preferably, 0.4~10㎛. 이에 의해, 순방향 전압(Vf)을 저감할 수 있다. This makes it possible to reduce the forward voltage (Vf). 또한, 클래드층의 전체의 Al의 평균 조성은, 0.02∼0.15인 것이 바람직하다. In addition, the average composition of Al of the entire cladding layer is preferably, from 0.02 to 0.15. 이에 의해, 크랙의 발생을 억제할 수 있어, 레이저 도파로와의 굴절율차를 얻을 수 있다. This makes it possible to suppress the occurrence of cracks, it is possible to obtain a refractive index difference between the laser waveguide. n형 불순물은, 예를 들면, Si, Ge, Sn, S, O, Ti, Zr, Cd 등을 들 수 있고, p형 불순물은, Mg, Be, Zn, Mn, Ca, Sr 등을 들 수 있다. n-type impurity is, for example, include Si, Ge, Sn, S, O, Ti, Zr, may be mentioned Cd, etc., p-type impurity is Mg, Be, Zn, Mn, Ca, Sr, etc. have. 불순물 농도는 5×10 16 /㎤∼1×10 21 /㎤ 정도가 바람직하다. Impurity concentration is about 5 × 10 16 / ㎤~1 × 10 21 / ㎤ preferred. 특히, n형 불순물의 도핑량은, 1×10 17 /㎤∼5×10 19 /㎤인 것이 바람직하다. In particular, the dose of the n-type impurity, it is preferably 1 × 10 17 / ㎤~5 × 10 19 / ㎤. 이에 의해, 저항율을 낮게 할 수 있으며, 또한 결정성 을 손상하지 않는다. As a result, it is possible to lower the resistivity, and does not impair the crystallinity. p형 불순물의 도핑량은, 1×10 19 /㎤∼1×10 21 /㎤인 것이 바람직하다. dose of the p-type impurity, it is preferable that 1 × 10 19 / ㎤~1 × 10 21 / ㎤. 이에 의해, 결정성을 손상하지 않는다. As a result, it does not impair the crystallinity. 불순물 도핑은 변조 도핑이어도 된다. Impurity doping may be modulation doping. 기판(101) 상에 반도체층(200)을 적층한 웨이퍼를, 반도체 성장 장치의 반응 용기로부터 추출하고, n측 층을 에칭함으로써, 예를 들면, n측 클래드층까지 노출시킨다. A wafer stacking a semiconductor layer 200 on the substrate 101, by etching the extraction, and the n-layer of the reactor of the semiconductor growing apparatus, for example, are exposed to the n-side cladding layer. 이에 의해, 응력을 완화할 수 있다. This makes it possible to relax the stress. 또한, 이 공정은 생략할 수 있으며, 에칭에 의해 노출시키는 면은, 반드시 n측 클래드층이 아니어도 된다. In addition, the process of exposing surface by may be omitted, and etching, and is even not necessarily the n-side cladding layer. 에칭은, RIE법을 이용하여 Cl 2 , CCl 4 , BCl 3 , SiCl 4 가스 등의 염소계 가스에 의해 행할 수 있다. Etching can be carried out by chlorine-based gas such as Cl 2, CCl 4, BCl 3 , SiCl 4 gas using RIE method. 계속해서, 도 8의 (b)에 도시한 바와 같이 p측 층 표면에 스트라이프 형상의 릿지부를 형성한다. Subsequently, the forming of the stripe ridge of the p-type layer surface, as shown in (b) of Fig. 릿지부의 형성은, 우선, p측 층의 최상층인 p측 컨택트층(209)의 표면에 보호막(도시 생략)을 형성한다. Forming the ridge portion is, first, to form a protective film (not shown) on the surface of the p-layer of p-type contact layer 209 is the top layer of. 이 보호막은, 릿지부의 형상에 대응하는 패턴이다. The protective film is a pattern corresponding to the ridge portion shape. 이 보호막을 마스크로 하여, p측 층을 에칭 제거한다. By the protective film as a mask, etching to remove the p-layer. 릿지부는, 도파로 영역을 규정하는 것으로, 폭은 1.0㎛∼100.0㎛ 정도, 높이(에칭 깊이)는, 적어도 p측 클래드층을 노출하는 범위이면 된다. Ridge section that defines the waveguide region, the width 1.0㎛~100.0㎛ degree of height (etching depth) is in a range that exposes at least a p-side cladding layer. 공진기 길이는 300㎛∼1000㎛ 정도가 바람직하다. The resonator length is preferably about 300㎛~1000㎛. 싱글 모드의 레이저광으로 하는 경우에는, 폭은 1.0㎛∼3.0㎛로 하는 것이 바람직하다. When a laser beam of single mode, the width is preferably set to 1.0㎛~3.0㎛. 릿지부의 폭을 5㎛ 이상으로 하면, 1W 이상의 고출력이 가능하게 된다. When the ridge portion width less than 5㎛, over 1W high output is possible. 또한, 대전류를 흘리면, 릿지부 바로 아래에서는 전류가 급격하게 가로 방향으로 퍼지기 때문에, 릿지부의 높이는 p측 광 가이드층까지인 것이 바람직하다. In addition, spill a large current, since the ridge portion in the right to the current is suddenly spread in the transverse direction below, it is preferred that up to the p-side optical waveguide layer to increase the ridge portion. 또한, 릿지는, 상술한 저전위 밀도 영역(제1 영역)의 상방에 배치되도록 형성하는 것이 바람직하다. In addition, the ridge is preferably formed so as to be disposed above the above-mentioned low dislocation density region (the first region). 그 후, 도 8의 (c)에 도시한 바와 같이, 릿지부의 측면을 매립막(220)으로 보호한다. Then, as shown in (c) of Figure 8, it protects the ridge side surface of the embedded film 220. 이 매립막(220)은, 반도체층보다 굴절율이 작고, 절연성의 재료로부터 선택하는 것이 바람직하다. The embedded film 220 is smaller than the refractive index of the semiconductor layer, it is preferable to select from the insulating material. 구체적으로 설명하면, ZrO 2 , SiO 2 , V, Nb, Hf, Ta, Al 등의 산화물의 단층 또는 다층을 들 수 있다. More specifically, there may be mentioned a single-layer or multi-layer of an oxide of ZrO 2, SiO 2, V, like Nb, Hf, Ta, Al. 계속해서, p측 컨택트층(209)의 릿지부의 상면에 p 전극(230)을 형성한다. Subsequently, a p-electrode 230 on the upper surface of the ridge portion p-type contact layer 209. 바람직하게는, p측 컨택트층(209) 및 매립막(220) 상에 p 전극(230)을 형성한다. Preferably, a p-side contact layer 209 and the buried p-type electrode layer 230 on the (220). p 전극은 다층 구조, 예를 들면, Ni(50∼200Å: 하층)/Au(500∼3000Å: 상층), Ni/Au/Pt(500∼5000Å) 또는 Ni/Au/Pd(500∼5000Å)가 바람직하다. The p-electrode is a multi-layer structure, for example, Ni (50~200Å: a lower layer) / Au (500~3000Å: top layer), Ni / Au / Pt (500~5000Å) or Ni / Au / Pd (500~5000Å) is desirable. p 전극(230)을 형성한 후, 300℃ 이상, 바람직하게는 500℃ 이상에서, 질소 및/또는 산소 분위기 하에서, 오믹 어닐링을 행하는 것이 바람직하다. At p after forming the electrode 230, more than 300 ℃, preferably at least 500 ℃, it is preferable to carry out in a nitrogen and / or oxygen atmosphere, ohmic annealing. 다음으로, 도 8의 (d)에 도시한 바와 같이 전 공정에서 노출된 n측 층의 측면 등에 보호막(240)을 형성한다. Next, a protective film 240 or the like the side of an n-layer exposed in the previous step as shown in Fig. 8 (d). 또한, 이 보호막은, 도 2의 (b)에 도시한 바와 같이 적어도 n측 층 및 p측 층의 측면을 피복하고 있으면 되고, p 전극(230)의 일부를 피복하지 않아도 된다. In addition, the protective film, even if to cover the side surface of at least the n-layer and p-layer as shown in 2 (b) and, p is not necessary to cover the portion of the electrode 230. 또한, p 전극(230) 상에 패드 전극(250)을 형성한다. In addition, p electrode to form a pad electrode 250 on 230. The 패드 전극(250)은, Ni, Ti, Au, Pt, Pd, W 등의 금속으로 이루어지는 적층 구조, 예를 들면, W/Pd/Au(1000Å 이상) 또는 Ni/Ti/Au(1000Å 이상)로 할 수 있다. A pad electrode 250, Ni, Ti, Au, Pt, Pd, e. Made of a metal laminate structure, for example, such as W, W / Pd / Au (more than 1000Å) or Ni / Ti / Au (more than 1000Å) can do. 도 8의 (e)에 도시한 바와 같이 기판(101)의 제2 주면에 n 전극(210)을 형성한다. To form an n-electrode 210 on the second main surface of the substrate 101 as shown in FIG. 8 (e). n 전극은, Ti, Ni, Au, Pt, Al, Pd, W, Rh, Ag, Mo, V, Hf로 이루어지는 군으로부터 선발되는 적어도 1종의 금속에 의해, 제2 주면의 일부 또는 전면에 형성하는 것이 바람직하다. n electrode is formed on a part or entire surface of the second main surface by at least the metal of one kind selected from the group consisting of Ti, Ni, Au, Pt, Al, Pd, W, Rh, Ag, Mo, V, Hf it is preferable to. 이에 의해, 기판과 n 전극의 오믹 특성이 용이하게 얻어지고, 밀착성도 좋아, 웨이퍼를 분할하기 위한 벽개 공정 등에서의 전극 박리를 방지할 수 있다. As a result, is easily obtained the ohmic characteristic of the substrate and the n-electrode, the adhesion is also good, it is possible to prevent the electrode peeling of the cleavage process, etc. to divide the wafer. n 전극이 다층 구조인 경우, 최상층은 Pt 또는 Au인 것이 바람직하다. When the n-electrode is a multi-layer structure, the top layer is preferably Pt or Au. 이에 의해, 전극으로부터의 방열성을 향상시킬 수 있다. As a result, it is possible to improve the heat dissipation from the electrodes. n 전극의 막 두께는, 10000Å 이하, 또한 6000Å 이하가 바람직하다. The thickness of the n-electrode is, 10000Å or less, and is preferably not more than 6000Å. 다층 구조의 경우, 예를 들면, 기판측이 V, Ti, Mo, W, Hf 등(500Å 이하, W인 경우에는 300Å 이하)인 것이 바람직하다. For a multi-layer structure, for example, the substrate side is V, Ti, Mo, W, Hf or the like is preferred that (in the case of 500Å or less, W is less than 300Å). V인 경우에는, 막 두께는 50∼300Å 이하, 또한, 70∼200Å가 바람직하다. If the V, the film thickness is preferably in the 50~300Å or less, and, 70~200Å. 이에 의해, 양호한 오믹 특성을 얻을 수 있어, 내열성을 향상시킬 수 있다. This makes it possible to obtain good ohmic characteristics, can improve the heat resistance. 구체적으로 설명하면, Ti(100Å: 기판측)/Al(5000Å), Ti/Pt/Au(60Å/1000Å/3000Å), Ti(60Å)/Mo(500Å)/Pt(1000Å)/Au(2100Å), Ti(60Å)/Hf(60Å)/Pt(1000Å)/Au(3000Å), Ti(60Å)/Mo(500Å)/Ti(500Å)/Pt(1000Å)/Au(2100Å), W/Pt/Au, W/Al/W/Au, Hf/Al, Ti/W/Pt/Au, Ti/Pd/Pt/Au, Pd/Pt/Au, Ti/W/Ti/Pt/Au, Mo/Pt/Au, Mo/Ti/Pt/Au, W/Pt/Au, V/Pt/Au, V/Mo/Pt/Au, V/W/Pt/Au, Cr/Pt/Au, Cr/Mo/Pt/Au, Cr/W/Pt/Au 등을 들 수 있다. Specifically, Ti (100Å: substrate side) / Al (5000Å), Ti / Pt / Au (60Å / 1000Å / 3000Å), Ti (60Å) / Mo (500Å) / Pt (1000Å) / Au (2100Å) , Ti (60Å) / Hf (60Å) / Pt (1000Å) / Au (3000Å), Ti (60Å) / Mo (500Å) / Ti (500Å) / Pt (1000Å) / Au (2100Å), W / Pt / Au, W / Al / W / Au, Hf / Al, Ti / W / Pt / Au, Ti / Pd / Pt / Au, Pd / Pt / Au, Ti / W / Ti / Pt / Au, Mo / Pt / Au, Mo / Ti / Pt / Au, W / Pt / Au, V / Pt / Au, V / Mo / Pt / Au, V / W / Pt / Au, Cr / Pt / Au, Cr / Mo / Pt / It may include Au, Cr / W / Pt / Au or the like. n 전극을 형성한 후에는, 300℃ 이상에서 어닐링해도 된다. After forming the n electrode, it may be annealed at above 300 ℃. n 전극은, 제2 주면측에, 후 공정인 기판을 바화하기 위한 스크라이브 공정에서 스크라이브 라인으로 되는 영역을 제외한 범위에, 사각형으로 형성하는 것이 바람직하다. n electrode is in the range other than the area in which the second major surface side of the scribe in the scribing step for bahwa a later step the substrate line, it is preferable to form a square. 또한, n 전극 상에는, n 전극과 마찬가지의 패턴 형상으로 메탈라이즈 전극을 형성해도 된다. In addition, n may be formed by a metallized electrode pattern shape of the electrode formed on the, n electrode and the like. 이에 의해, 스크라이브하기 쉬워져, 벽개성이 향상된다. As a result, tends to scribe, the cleavage is improved. 메탈라이즈 전극으로서는, Ti-Pt-Au-(Au/Sn), Ti-Pt-Au-(Au/Si), Ti-Pt-Au-(Au/Ge), Ti-Pt-Au-In, Au/Sn, In, Au/Si, Au/Ge 등을 들 수 있다. As the metallized electrode, Ti-Pt-Au- (Au / Sn), Ti-Pt-Au- (Au / Si), Ti-Pt-Au- (Au / Ge), Ti-Pt-Au-In, Au / Sn, and the like in, Au / Si, Au / Ge. 또한, 이 기판의 제2 주면에도, 오프각이나 요철 단차를 형성해도 된다. In addition, in the second main surface of the substrate board or the or each concave-convex stepped off. 요철 단차를 형성함으로써, 제2 주면을 (000-1)면으로 하면, (000-1)면 이외의 경사면을 노출시킬 수 있다. By forming the concave and convex stepped section, when the second main surface to the surface (000-1), it is possible to expose an inclined face other than the (000-1) plane. (000-1)면 이외의 경사면은, n 극성을 나타내는 면에서의 표면적의 0.5% 이상 또한 1∼20% 정도가 바람직하다. Inclined surface other than (000-1) plane is more than 0.5% of the surface area of ​​the face showing n-polarity is also preferably about 1 to 20%. 이에 의해, n 전극의 오믹 특성을 향상시킬 수 있다. As a result, it is possible to improve the ohmic characteristics of the n electrode. 여기서, 단차란, 계면 단차가 0.1㎛ 이상이고, 단차 형상은 테이퍼 형상, 역테이퍼 형상의 것을 들 수 있다. Here, the step is, a surface level difference is more than 0.1㎛, the stepped shape can be given a tapered shape, an inverse tapered shape. 단차의 평면 형상은, 스트라이프 형상, 격자 형상, 섬 형상, 원 형상이나 다각 형상, 사각 형상, 빗 형상, 메쉬 형상으로부터 선택할 수 있다. The plane shape of the level difference is, stripe-shaped, grid-shaped, island-like, circular shape or a polygonal shape, a rectangular shape, a comb shape, and may be selected from the mesh. 예를 들면, 원 형상의 볼록부를 형성하면, 원 형상 볼록부의 직경 폭은 5㎛ 이상으로 할 수 있다. For example, by forming a convex part of a circle shape, a circular shape the diameter of the convex portion width can be less than 5㎛. 또한, 오목부 홈부의 폭은 적어도 3㎛ 이상의 영 역을 가지면, 전극의 박리 등이 없어져 바람직하다. Moreover, the recess groove portion has the width of area of ​​at least 3㎛, it is preferable eliminated, such as the peeling of the electrode. 제2 주면에서, (000-1)면 이외의 경사면을 노출시키기 위해서는, 오프각을 0.2∼90°의 범위에서 형성하는 것이 적당하다. In a second main surface, (000-1) in order to expose an inclined face other than the surface, it is appropriate to form an off-angle in the range of 0.2~90 °. 스트라이프 형상의 p 전극(230)에 수직인 방향에서, 반도체층의 공진면을 형성하기 위해 웨이퍼를 바 형상으로 분할한다. In the direction perpendicular to the p electrode 230 of stripe shape, and divides the wafer into a bar shape to form the resonance surface of the semiconductor layer. 공진면은, M면(1-100), A면(11-20)으로 하는 것이 바람직하다. Resonance surface is preferably in M ​​plane (1-100), A plane (11-20). 분할 방법으로서는, 블레이드 브레이크, 롤러 브레이크 또는 프레스 브레이크 등을 들 수 있다. As the splitting method, there may be mentioned a blade brake, roller brake, or the press brake or the like. 이 분할은, 우선 벽개 보조홈을 형성하고, 계속해서 분할하는 2단계에서 행하는 것이 바람직하다. This division is preferably carried out in the step of first forming a cleavage auxiliary grooves, and subsequently divided. 이에 의해, 공진면을 수율 좋게 형성할 수 있다. This makes it possible to form the resonance surface good yield. 즉, 우선, 기판의 제1 또는 제2 주면측으로부터, 스크라이브에 의해 벽개 보조홈을 형성한다. That is, first, from the first or the second main surface side of the substrate, to form a secondary cleavage groove by scribing. 이 홈은 웨이퍼의 전면 또는 바로 되는 영역의 웨이퍼의 양단에 형성한다. A groove is formed at both ends of the front right region of the wafer or that the wafer. 홈을 바를 형성하는 벽개 방향으로, 파선 형상으로 간격을 두고 형성하는 것이 바람직하다. A cleavage groove in the direction of forming the bar, it is preferable to form at a distance by a broken line shape. 이에 의해, 벽개 방향이 굴곡하는 것을 억제하여, 용이하게 벽개할 수 있다. Thus, to inhibit the cleavage direction of winding it can be easily cleaved. 또한, 이 홈을 제2 주면에 형성함으로써, FFP의 리플을 억제할 수 있음과 함께, 전극의 박리를 방지할 수 있다. Further, by forming this groove on the second main surface, with a ripple of the FFP can be suppressed, it is possible to prevent peeling of the electrode. 다음으로, 브레이커에 의해 웨이퍼를 바 형상으로 분할한다. Next, divide the wafer by the breaker bar shape. 벽개 방법으로서는, 블레이드 브레이크, 롤러 브레이크 또는 프레스 브레이크 등을 들 수 있다. As the cleavage method, there may be mentioned a blade brake, roller brake, or the press brake or the like. 벽개에 의해 형성된 공진면의 광 반사측 및/또는 광 출사면에는, 반사 미러 를 형성해도 된다. The light reflecting side and / or the light exit side of the resonance surface is formed by cleavage, or formed of a reflecting mirror. 반사 미러는, SiO 2 , ZrO 2 , TiO 2 , Al 2 O 3 , Nb 2 O 5 등의 유전체 다층막에 의해 형성할 수 있다. Reflecting mirror, it can be formed by a dielectric multi-layer film such as SiO 2, ZrO 2, TiO 2 , Al 2 O 3, Nb 2 O 5. 특히, 출사 단부면측에는 Al 2 O 3 또는 Nb 2 O 5 가 바람직하다. In particular, when the emitting end face side Al 2 O 3 or Nb 2 O 5 is preferred. 이에 의해, 수명 특성이 양호해진다. Thereby, it becomes excellent in life characteristics. 벽개에 의해 형성된 공진면이면, 반사 미러를 재현성 좋게 형성할 수 있다. If the resonance surface is formed by cleavage, it is possible to form the reflecting mirror with good reproducibility. 또한, 바 형상으로 된 기판을 전극의 스트라이프 방향으로 평행하게 분할하여, 소자를 칩화한다. Further, a substrate with a bar-like and parallel to the partition in a stripe direction of the electrode, and a single chip device. 칩화한 후의 형상은 사각형인 것이 바람직하고, 공진면의 폭은 500㎛ 이하, 또한, 400㎛ 이하인 것이 바람직하다. Profile after a single chip it is preferable that the width of the desirable, and the resonance surface is 500㎛ square or less, and, 400㎛ or less. 이와 같이 하여 얻어진 레이저 소자는, FFP의 리플을 억제한 긴 수명 등의 특성을 갖는다. Laser device thus obtained is, has a property, such as a long life suppressing the ripple of the FFP. 또한, 대향 전극 구조의 소자이기 때문에, 접촉 저항율을 1.0E -3 Ω ㎠ 이하로 저감시킬 수 있다. In addition, since the device of the counter electrode structure, it is possible to reduce the contact resistivity to less than 1.0E -3 Ω ㎠. 또한, 이 소자는, 기판 상에 복수의 도파로 영역을 갖는 레이저 소자이어도 되고, 와이드 릿지부를 갖는 레이저 소자이어도 된다. In addition, the device, may be a laser device having a plurality of waveguide regions on the substrate may be a laser device having a wide ridge. 또한, 본 발명의 소자는, 주로, 제1 도전형(예를 들면, n형)층과 제2 도전형(예를 들면, p형)층 사이에, 활성층을 포함하는 코어 영역을 갖는 것이 바람직하다. In addition, the device of the present invention, mainly the first conductivity type (for example, n-type) layer and a second conductivity type preferably between (for example, p-type) layer, having a core region including an active layer Do. 여기서, 코어 영역이란, 광 도파로 영역, 즉, 활성층에서 발생한 광을 폐쇄하여, 광파를 감쇠시키지 않고 도파시킬 수 있는 영역을 의미한다. Here, the core region means a, the optical waveguide region, i.e., a region capable of closing the waveguide to the light generated in the active layer, the light waves without attenuation. 통상적으로, 활성층과 이것을 사이에 두는 광 가이드층이 코어 영역을 구성하고, 그 막 두께는, 예를 들면, 100Å∼1.5㎛ 정도인 것이 적당하다. Typically, the configuration of the light guide layer is the core region so as to sandwich the active layer and this, and its film thickness is, for example, suitably be a 100Å~1.5㎛ degree. n형 및 p형층을 구성하는 반도체층은, 특별히 한정되는 것이 아니라, 예를 들면, 상술한 질화물 반도체층을 들 수 있다. The semiconductor layers constituting the n-type and p-type layer is not particularly limited, and for example, there may be mentioned the above-described nitride semiconductor layer. 이 소자에서는, n형 및 p형 층 중 적어도 한쪽에, 특히, n형 층에, 코어 영역의 최외층에 인접하여, 제1 질화물 반도체층(이하, 「제1 층」이라고 함) 및 제2 질화물 반도체층(이하, 「제2 층」이라고 함)이 이 순서로 배치되어 있는 것이 바람직하다. In this device, at least one of n-type and p-type layer, in particular, the n-type layer, adjacent to the outermost layer of the core region, the (hereinafter referred to as a "first layer"), the first nitride semiconductor layer and the second that in the nitride semiconductor layer (hereinafter referred to as the "second layer") are arranged in this order is preferred. n형 층에서, 제1 층 및 제2 층은, 각각, 광의 출사 각도를 조정하기 위한 층, 광 가이드층 및 클래드층으로서 기능하는 것이지만, 이들 층의 적층에 의해, 이들 기능을 조정할 수 있다. In the n-type layer, the first layer and the second layer, respectively, but which functions as a layer, the optical guide layer and the cladding layer for adjusting the light output angle, by lamination of the layers, it is possible to adjust these functions. 즉, n층 또는 p층을 다층화, 특히 n층을 다층화함으로써, FFP가 좁아져, 활성층에서의 이득을 감소시키지 않고, NF P를 넓게 할 수 있다. That is, by the multi-layered multi-layered, in particular the n-layer to the n-layer or p-layer, FFP is narrowed, without reducing gain in the active layer, it is possible to widen the NF P. 이에 의해, 임계값 전류를 유지할 수 있다. Thereby, it becomes possible to keep the threshold current. 또한, 광의 출사 각도를 상향, 하향 등으로 조정할 수 있어, 광 출력 효율을 향상시켜 집광율이 양호한 소자를 얻을 수 있다. In addition, the upward angle of the light output, can be adjusted downward or the like, can improve the light output efficiency obtained having good light-condensing rate element. 또한, 제1 층과 코어 영역의 최외층, 제2 층과 제1 층은, 굴절율이 상이한 것이 바람직하고, 특히, 제1 층이 코어 영역의 최외층보다 저굴절율을 갖고 및/또는 제2 층이 제1 층보다 저굴절율을 갖는 것이 바람직하다. In addition, the first layer and the outermost layer, the second layer and the first layer of the core region, the refractive index is different from that desired, and in particular, the first layer has a lower refractive index than the outermost layer of the core region and / or the second layer to have a lower refractive index than the first layer. 이들 층은, 코어 영역의 최외층으로부터 순서대로 굴절율이 낮아지도록 설정되어 있는 것이 바람직하다. The layer is preferably, is set to be the refractive index is lowered, as from the outermost layer of the core region sequence. 이에 의해, 안정된 광의 폐쇄에 의해, 활성층으로부터 조사되는 빔을 안정화시킬 수 있다. As a result, by the stable closing of light, it is possible to stabilize the beam emitted from the active layer. 그 결과, 레이저 광원으로서 응용이 확대된다. As a result, the application is enlarged as a laser light source. 또한, 코어 영역의 최외층과 제1 층의 굴절율차(Δn 1 ) 및/또는 제1 층과 제2 층의 굴절율차(Δn 2 )가, 0.004∼0.03인 것이 바람직하다. Further, it is a refractive index difference (Δn 1) and / or the refractive index difference of the first layer and the second layer (Δn 2) in the outermost layer of the core region and the first layer preferably from, 0.004 to 0.03. 이에 의해, 활성층에서 발생하는 광의 체재 영역을 한층 더 적절하게 조정할 수 있어, 안정된 광의 폐쇄를 행하는 것이 가능하게 된다. This makes it possible to more appropriately adjust the light generated from the active layer format region, it becomes possible to perform a stable light closure. 그 결과, FF P의 발산각의 제어가 가능하게 된다. As a result, it is possible to control the divergence angle of the FF P.
또한, n형 층에서는, 코어 영역의 최외층에 인접하여 형성되는 층은 2층에 한하지 않고, 3층 이상, 예를 들면, m층(m≥2) 형성해도 된다. Further, n-type layer, the layers are formed adjacent to the outermost layer of the core region is not limited to two layers, three or more layers, for example, or formed of layer m (m≥2). 그 상한은 특별히 한정되지 않는다. The upper limit is not particularly limited. 광의 폐쇄 효과를 고려하면 10층 이하, 8층 이하, 또한 6층 이하가 적당하다. Considering the light closing effect layer 10 or less, 8 or less layers, it is also suitable to 6 layers. 특히, 코어 영역의 최외층과 제m 층의 굴절율차(Δn m )는 0.008∼0.05, 0.007∼0.05의 범위 내인 것이 바람직하다. In particular, the outermost layer of the core region and the refractive index difference of the m-th layer (Δn m) is preferably in the range of from 0.008 to 0.05, 0.007 to 0.05. 이러한 범위로 설정함으로써, 광의 폐쇄를 완화하여 FF P의 발산각을 제어하면서, 광의 누설을 방지할 수 있다. By setting to such a range, to reduce the light closed while controlling the divergence angle of the FF P, it is possible to prevent the leakage of light. n형 층의 굴절율은, 통상적으로, 그 조성에 따라 조정할 수 있으며, 예를 들면, Al의 혼정비를 크게 함으로써, 굴절율을 작게 할 수 있다. The refractive index of the n-type layer is, typically, can be adjusted depending on the composition, for example, it may be by increasing the mixing ratio of Al, reducing the refractive index. 예를 들면, 제1 층과 제2 층 사이에서 0.004∼0.03의 굴절율차를 얻기 위해, 양자에서 Al의 조성비에 0.01∼0.07 정도 차이를 설정하는 것이 적당하다. For example, the first to obtain a refractive index difference of 0.004 to 0.03 between the first layer and the second layer, it is appropriate to set a degree of from 0.01 to 0.07 the difference in the composition ratio of Al in both. 또한, 제1 층 및/또는 제2 층이, X층과 Y층의 초격자 구조로 이루어지는 경우에는, 어느 하나의 층의 막 두께만을 변화시키는, 예를 들면, 제1 층에서는 X층을 두껍게 하고, 제2 층에서는 X층을 얇게 하는 것 등에 의해, n형 층의 굴절율을 조정할 수 있다. In addition, the first layer and / or the second layer, if made of a super lattice structure of the X layer and a Y layer, e., For which any change only the thickness of the layer, the first layer thicker the X layer , in or the like to thin the X layer and the second layer, and it is possible to adjust the refractive index of the n-type layer. n형 층에서, 제1 층 및 제2 층은, 예를 들면, 막 두께 1000∼10000Å 정도가 적당하다. In the n-type layer, the first layer and the second layer is, for example, it is suitably in the film thickness of about 1000~10000Å. 또한, 제1 층∼제m 층까지 형성되어 있는 경우에는, 그 합계가 2000∼40000Å 정도인 것이 적당하다. Further, in the case where the layer is formed by one-m th floor, it is advisable that a total of 2000~40000Å degree. 특히, n형 층이, Al x Ga 1-x N(0<x<1)을 포함하여 형성되어 있는 경우에는, 적어도, 코어 영역의 최외층으로부터 500∼5000Å 정도의 위치에 0.004∼0.03 정도의 굴절율차를 갖는 층, 1500∼20000Å 정도의 위치에 0.004∼0.03 정도의 굴절율차를 갖는 층이 배치되는 것이 바람직하고, 또한, 2500∼25000Å 정도의 위치에 0.004∼0.03 정도의 굴절율을 갖는 층이 배치되어 있는 것이 보다 바람직하다. In particular, n-type layer, when formed, including the Al x Ga 1-x N ( 0 <x <1), of 0.004 to 0.03 degree in the least, the degree 500~5000Å position from the outermost layer of the core region layer having a refractive index difference, to which the layer is disposed having a refractive index difference of 0.004 to 0.03 preferably in the degree of 1500~20000Å degree position, and further, the layers are arranged having a refractive index of 0.004 to 0.03 degree in the degree position 2500~25000Å it is more preferable that is. 이에 의해, 그 조성 및 막 두께에 상관없이, 층 내부의 크랙의 발생을 방지할 수 있다. As a result, regardless of its composition and thickness, it is possible to prevent the occurrence of cracks of the inner layer. 따라서, 보다 적절한 광의 폐쇄를 실현할 수 있다. Accordingly, it is possible to realize the more appropriate light closure. 또한, n형 질화물 반도체층측에 m층의 n형 질화물 반도체층을 갖고, 또한 p형 질화물 반도체층에 제1 p형 반도체층을 포함하며, 제m의 n형 질화물 반도체층이, 제1 p형 질화물 반도체층의 굴절율보다 높은 굴절율을 갖는 경우에는, p측에서의 광의 폐쇄 효과를 강하게 함으로써, 보다 안정된 광의 폐쇄를 행할 수 있다. Further, the n-type nitride semiconductor layer side has an n-type nitride semiconductor layer of m layers, and a p-type nitride, and a semiconductor layer including a first 1 p-type semiconductor layer, the n-type nitride semiconductor layer of a m, claim 1 p-type If having a higher refractive index than the refractive index of the nitride semiconductor layer, a p-side light by strongly closing effect, it is possible to perform more stable light closure. 또한, n측에서의 폐쇄를 p측보다 약하게 함으로써, n측에서의 킹크의 발생을 방지하는 것이 가능하게 된다. Furthermore, by weakening the closing side than the p-n, it is possible to prevent generation of kink at the side n.
n형 층에, 상술한 제1 층 및 제2 층이 형성되어 있는 것이면, p형 층에, 반드시, 제1 층 및 제2 층이 형성되어 있지 않아도 된다. The n-type layer as long as it is formed in the first layer and the second layer described above, the p-type layer, necessarily, a is not necessarily the first layer and the second layer is formed. p형 층에 제1 층이 형성되어 있는 경우에는, 이 제1 층과 코어 영역의 최외층의 굴절율차는 특별히 한정되지 않지만, 예를 들면, 0.01∼0.2 정도가 적당하다. If the first layer is formed on the p-type layer, a first refractive index difference is not particularly limited as long as the outermost layer of the first layer and the core region, for example, approximately 0.01 to 0.2 is suitable. 또한, 제1 층은, 코어 영역의 최외층보다 굴절율이 작은 것이 바람직하다. In addition, the first layer has a refractive index that is less preferable than the outermost layer of the core region. 이에 의해, 광의 폐쇄를 확실하게 행할 수 있다. Thereby, it becomes possible to reliably perform the closing of light. 또한, 제m 층과 제1 층의 굴절율차는, 예를 들면, 0.004∼0.03 정도인 것이 바람직하다. The refractive index difference of the m-th layer and the first layer, for example, is preferably 0.004 to 0.03 degree. 제1 층은, 제m 층보다 굴절율이 작은 것이 바람직하다. The first layer, that a refractive index smaller than the m layer are preferred. 또한, 제1 층의 막 두께는, 예를 들면, 1000∼10000Å 정도가 적당하다. Further, the film thickness of the first layer is, for example, the degree 1000~10000Å is suitable. 제1 층은, GaN과 AlGaN을 적층한 초격자 구조로 하는 것이 바람직하다. The first layer, it is preferable that the GaN and AlGaN superlattice structure han laminating. 또한, p측의 굴절율을 n측보다 작게 하기 위해, Al의 혼정비를 높게 설정하였다고 해도, 그 막 두께를 박막화함으로써 내부의 크랙의 발생을 방지할 수 있어, 디바이스의 안정성을 유지할 수, 즉, 누설 전류를 저감시킬 수 있다. Further, in order to decrease the refractive index of the p-side than the n-side, even if setting the mixing ratio of Al higher, by thinning the film thickness can be prevented the occurrence of internal cracking, maintaining the device reliability, that is, it is possible to reduce the leakage current. 광 가이드층은, 질화물 반도체로 이루어지며, 도파로 형성에 충분한 에너지 밴드 갭을 갖고 있으면, 그 조성, 막 두께 등은 특별히 한정되는 것이 아니라, 단층, 다층, 초격자층 중 어느 것의 구조를 갖고 있어도 된다. Optical guide layer is made of a nitride semiconductor, if they have a sufficient energy band gap in a waveguide formed, the composition, thickness, etc. it is not particularly limited, and may have a structure of any of the single-layer, multi-layer, a superlattice layer . 구체적으로 설명하면, 파장 370∼470㎚에서는, GaN을 이용하고, 그것보다 장파장에서는 InGaN/GaN의 다층 또는 초격자층을 이용하는 것이 적당하다. More specifically, the wavelength of the 370~470㎚, using GaN and, in the longer wavelength than it is suitable to use a multi-layered or super lattice structure of InGaN / GaN. 광 가이드층을 구성하는 질화물 반도체의 조성, 막 두께, 구조 등은, n측 및 p측에서 동일해도 되고, 달라도 된다. Composition of the nitride semiconductors constituting the optical guide layer, the film thickness, structure, etc., may be the same in the n-side and p-side, are different. 등을 들 수 있다. And the like. 이들 층은, 임의로 조합할 수 있다. These layers can be arbitrarily combined. 특히, 초격자층의 경우에는, 한쪽의 층 또는 양방의 층에서, 그 조성을 변화시키거나, 막 두께를 변화시키거나, 조성 및 막 두께를 변화시킴으로써, 각 층의 굴절율 및 굴절율차를 상술한 바와 같이 설정할 수 있다. In particular, the second case of the grating layer, the layer of the layer or both of the one side, and to a composition change, or to just changing the thickness, or by changing the composition and thickness, as described above the refractive index and the refractive index difference of each layer It can be set together. 이하에, 본 발명의 소자의 실시예를 나타낸다. Below, it shows an embodiment of a device of the present invention. 이 실시예의 반도체 레이저 소자의 구조를 도 1의 (b) 및 도 2의 (a)에 도시한다. The structure of this embodiment, the semiconductor laser device is shown in (b) and 2 (a) of FIG. 이 레이저 소자는, 주면으로서, 전위 밀도가 1×10 6 /㎠ 이하이고, (0001)면에 대하여 오프각 a가 0.3°인 GaN으로 이루어지는 기판(101) 상에, 저온 성장 버퍼층(도시 생략)과 중간층(도시 생략)을 개재하여, n측 클래드층(203), n측 광 가 이드층(204), 활성층(205), p측 캡층(206), p측 광 가이드층(207), p측 클래드층(208), p측 컨택트층(209)이 이 순서로 적층되어 구성된다. The laser device, as the main surface, and a dislocation density less than 1 × 10 6 / ㎠, ( 0001) on the substrate 101 made of the off angle a is 0.3 ° GaN with respect to the surface, low-temperature growth buffer layer (not shown) and an intermediate layer interposed therebetween (not shown), n-side cladding layer (203), n-side light guides layer 204, an active layer (205), p-side cap layer (206), p-type optical guide layer (207), p side cladding layer (208), p-type contact layer 209 is configured by laminated in this order. p측 컨택트층(209)의 표면에는 스트라이프 형상의 릿지부가 형성되어 있고, 릿지의 양측에는, p측 클래드층(208) 표면이 노출되어 있다. p-side surface of the contact layer 209 has been added, and the stripe ridge is formed, and is at both sides of the ridge, a p-side surface of the clad layer 208 exposed. p측 클래드층(208)의 노출된 면 및 릿지부의 측면에는 매립층(220)이 형성되어 있다. The p-side and the side face of the ridge exposed to the clad layer 208 has a buried layer 220 is formed. 릿지부의 상면에 접촉하고, 매립막(220) 상에 걸치는 영역에는 p 전극(230)이 형성되어 있다. Contacts the upper surface of the ridge portion, and the region extending over the buried layer 220 has a p-electrode 230 is formed. p 전극(230) 상의 일부으로부터 상술한 반도체의 적층체의 측면을 피복하는 보호막(240)이 형성되어 있다. p is a protective film 240 is formed to cover the side surface of the laminated body of the above-described semiconductor from the part on the electrode 230. 또한, p 전극(230) 상에는, p 패드 전극(250)이 형성되어 있고, GaN 기판(101)의 이면에는 n 전극(210)이 형성되어 있다. Further, it is formed on the p-electrode (230), p pad electrode 250 is formed, the back surface of the GaN substrate 101 has the n-electrode 210 is formed. 이러한 반도체 레이저 소자는, 이하의 제조 방법에 의해 형성할 수 있다. This semiconductor laser device may be formed by a manufacturing method described below. 우선, MOCVD 반응 장치 내에서, 사파이어 또는 GaAs로 이루어지는 이종 기판을 배치하고, 온도를 500℃로 한다. First, in the MOCVD reactor, placing a substrate of different material made of sapphire or GaAs, and the temperature at 500 ℃. 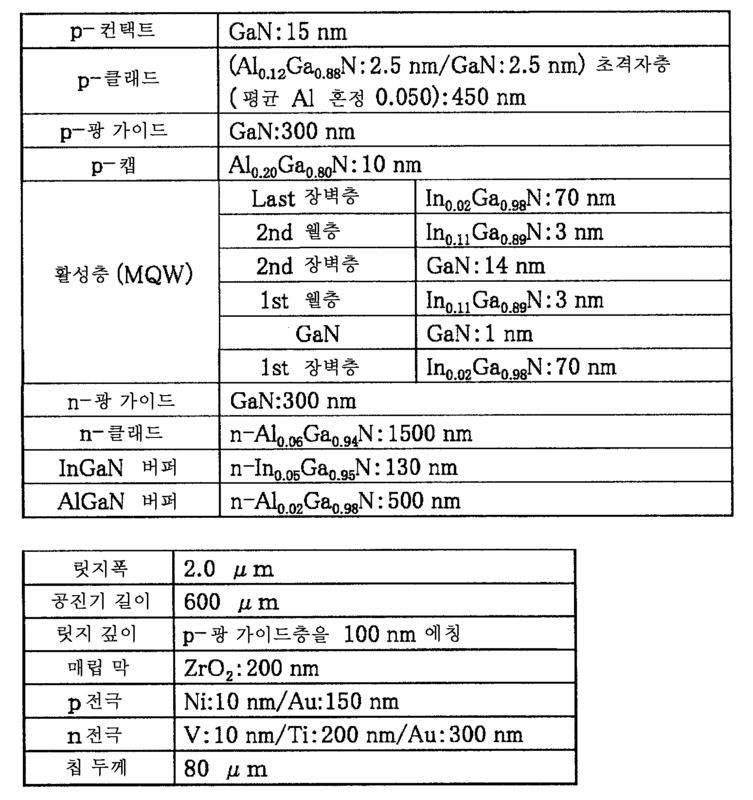 다음으로, 트리메틸갈륨(TMG), 암모니아(NH 3 )를 이용하여, GaN으로 이루어지는 버퍼층(200Å)을 성장시킨다. Next, using trimethyl gallium (TMG), ammonia (NH 3), to grow a buffer layer (200Å) composed of GaN. 그 후, 온도를 1050℃로 하여, GaN으로 이루어지는 제1 질화물 반도체층(4㎛)을 성장시킨다. After that, the temperature at 1050 ℃, thereby growing a first nitride semiconductor layer (4㎛) made of GaN. 계속해서, 웨이퍼를 반응 용기로부터 추출하고, 이 제1 질화물 반도체의 표면에, 스트라이프 형상의 포토마스크를 형성하여, CVD 장치에 의해 스트라이프 폭 10∼300㎛, 스트라이프 간격(창부) 5∼300㎛의 SiO 2 로 이루어지는 보호막을 형성한다. Then, extract the wafers from the reaction vessel and the surface of the first semiconductor, to form a stripe-shaped photo mask, the stripe width 10~300㎛, stripe interval (window portion) by the CVD apparatus 5~300㎛ to form a protective film made of SiO 2. 그 후, 웨이퍼를 HVPE 장치로 이송하고, 원료에 Ga 메탈, HCl 가스 및 암모니아를 이용하고, n형 불순물로서 실리콘(Si) 또는 산소(O)를 도핑하면서 GaN으로 이루어지는 제2 질화물 반도체(400㎛)를 성장시킨다. Thereafter, the wafer is transferred to the HVPE apparatus, Ga metal, HCl gas and the use of ammonia and the second nitride semiconductor while doping the silicon (Si) or oxygen (O) as an n-type impurity formed of GaN (of the raw material 400㎛ ) are grown to. 이와 같이, HVPE법으로 보호막 상에 100㎛ 이상의 GaN 후막을 성장시킴으로써, 결정 결함을, 2자릿수 이상, 저감시킬 수 있다. Thus, by growing the GaN thick film 100㎛ least on the protective film by HVPE process, crystal defects can be reduced more than two orders of magnitude. 이종 기판 등을 제거함으로써, 제2 질화물 반도체층으로 이루어지는 GaN을 질화물 반도체 기판(101)을 얻는다. By removing the substrate of different material, such as, a first GaN comprising a second nitride semiconductor layer to obtain a nitride semiconductor substrate (101). 기판(101)의 막 두께는 400㎛ 정도이고, 적어도 도파로의 형성을 의도하는 영역에서, 전위 밀도가 1×10 6 /㎠ 이하이다. In the area intended for the formation of a degree 400㎛, at least the thickness of the waveguide substrate 101, a dislocation density less than 1 × 10 6 / ㎠. 얻어진 기판(101)을 드라이 에칭 장치에, 소정 각도 기울어지게 하여 세트하고, 드라이 에칭함으로써, 기판(101)의 주면((0001면))에, 이 주면에 대하여, 릿지의 형성을 의도하는 방향으로, 0.3°의 오프각 a를 부여한다. To the resulting dry-etched substrate 101 device, in a direction of the main surface ((0001 plane)) of the by set, and dry etching by inclined a predetermined angle, the substrate 101, with respect to the major surface, intended to form the ridge , gives an off angle a of 0.3 °. 계속해서, 1000℃∼1080℃에서 TMA(트리메틸 알루미늄), TMG, 암모니아, 실란 가스를 이용하여, Si를 1×10 18 /㎤∼1×10 19 /㎤ 도핑한 Al 0.03 Ga 0.97 N으로 이루어지는 n측 클래드층(막 두께 2㎛)을 성장시킨다. Subsequently, 1000 ℃ by using TMA (trimethyl aluminum), TMG, ammonia and silane gas at ~1080 ℃, made of Si to 1 × 10 18 / ㎤~1 × 10 19 / ㎤ doped Al 0.03 Ga 0.97 N n side to grow a cladding layer (2㎛ film thickness). 계속해서, 실란 가스를 멈추고, 1000℃∼1080℃에서 도핑되지 않은 GaN으로 이루어지는 n측 광 가이드층(0.175㎛)을 성장시킨다. Subsequently, the silane gas stopped, thereby growing the n-side optical guide layer (0.175㎛) made of GaN undoped In 1000 ℃ ~1080 ℃. 이 층에는, n형 불순물을 도핑해도 되고, In을 함유시켜도 된다. The floor, and be doped with an n-type impurity, may be contained for In. 다음으로, 온도를 900℃ 이하로 하여, Si 도핑 In 0.02 Ga 0.98 N으로 이루어지는 장벽층(140Å)을 성장시키고, 계속해서 동일 온도에서, 비도핑 In 0.07 Ga 0.93 N으로 이루어지는 웰층(70Å)을 성장시킨다. Next, with the temperature below 900 ℃, growing a well layer (70Å) made at the same temperature for growing a barrier layer (140Å) composed of Si-doped In 0.02 Ga 0.98 N and, continuously, in a non-doped In 0.07 Ga 0.93 N thereby. 장벽층과 웰층을 2회 교대로 적층하고, 마지막으로 장벽층을 형성하여, 총 막 두께 560Å의 다중 양자 웰 구조(MQW)의 활성층을 형성한다. Depositing a barrier layer and a well layer alternately to two times and finally, forming the barrier layer to form an active layer of multiple quantum well structure (MQW) with a total thickness of 560Å. 다음으로, 900℃에서 또는 승온하고, TMG, TMA, 암모니아, Cp 2 Mg(시클로펜타 디에닐마그네슘)을 이용하여, p측 광 가이드층보다 밴드 갭 에너지가 큰, Mg를 1×10 19 /㎤∼1×10 20 /㎤ 도핑한 p형 Al 0.25 Ga 0.75 N으로 이루어지는 p측 캡층(100Å)을 성장시킨다. Next, at 900 ℃ or elevated temperature, TMG, TMA, ammonia, Cp 2 Mg (cyclopentadienyl magnesium) was, p-side light for a large band gap energy, Mg than the waveguide layer 1 × 10 19 / ㎤ using to 1 to grow a p-side cap layer (100Å) composed of a × 10 20 / ㎤ doped p-type Al 0.25 Ga 0.75 N. 이 층은 생략 가능하다. This layer can be omitted. 계속해서, Cp 2 Mg, TMA를 멈추고, 1000℃∼1050℃에서, 밴드 갭 에너지가 p측 캡층(10)보다 작은, 비도핑 GaN으로 이루어지는 p측 광 가이드층(약 0.14㎛)을 성장시킨다. Next, Cp 2 Mg, to stop the TMA, thereby growing the p-side optical guide layer (approximately 0.14㎛) consisting of a small, non-doped GaN than 1000 ℃ ~1050 ℃, the band gap energy of the p-side cap layer 10. 또한, 이 층에는 p형 불순물을 도핑해도 되고, In을 함유시켜도 된다. In addition, this layer may be doped with p type dopant, may be contained for In. 그 후, 1000℃∼1050℃에서 비도핑 Al 0.10 Ga 0.90 N으로 이루어지는 층(25Å)을 성장시키고, 계속해서 TMA를 멈추고, Mg 도핑 GaN으로 이루어지는 층(25Å)을 성장시켜, 총 막 두께 0.4㎛의 초격자층으로 이루어지는 p측 클래드층을 성장시킨다. Thereafter, the growth layer (25Å) composed of a non-doped Al 0.10 Ga 0.90 N at 1000 ℃ ~1050 ℃ and, continue to stop the TMA, so as to grow the layer (25Å) composed of Mg-doped GaN, the total thickness 0.4㎛ of the p-side cladding layer made in super lattice structure it is grown. 1050℃에서, p측 클래드층 상에, Mg를 1×10 20 /㎤ 도핑한 p형 GaN으로 이루어지는 p측 컨택트층(150Å)을 성장시킨다. In 1050 ℃, p on the side cladding layer, to grow a p-type contact layer (150Å) composed of Mg to 1 × 10 20 / ㎤ doped with p-type GaN. 계속해서, 웨이퍼를 반응 용기로부터 추출하고, 최상층의 p측 컨택트층의 표면에 SiO 2 로 이루어지는 보호막을 마스크로서 형성하며, RIE에 의해, SiCl 4 가스를 이용하여 에칭한다. Then, extract the wafers from the reaction vessel and form a protective film made of SiO 2 on the surface of the p-type contact layer of the top layer as a mask, by RIE, it is etched using SiCl 4 gas. 이에 의해, n측 클래드층(203)을 노출시킨다. Thus, to expose the n-side cladding layer 203.
p측 컨택트층(209)의 표면에, 스트라이프 형상의 SiO 2 로 이루어지는 보호막을 마스크로서 형성하고, RIE를 이용하여 SiCl 4 가스에 의해 에칭한다. forming a p-side on the surface of the contact layer 209, a protective film made of SiO 2 of the stripe as a mask, and by using the RIE etched by SiCl 4 gas. 이에 의해, 스트라이프 형상의 도파로 영역인 릿지부를 형성한다. Thus, to form parts of the ridge waveguide region of stripe shape. 계속해서, 릿지부의 측면을 ZrO 2 로 이루어지는 매립층(220)으로 보호한다. Then, to protect the side surface of the ridge buried layer 220 made of ZrO 2. 또한, 도파로 영역인 릿지부의 단면 근방에서, 릿지로부터 이격한 위치에 포토리소그래피 기술을 이용하여 복수의 개구부를 갖는 레지스트 패턴을 형성하고, RIE를 이용하여 SiCl 4 가스에 의해, n측 클래드층에 도달할 때까지 에칭한다. Further, in the vicinity of the end face of the ridge portion waveguide region, to form a resist pattern having a plurality of openings by photolithography at a position remote from the ridge, and, using the RIE reached by the SiCl 4 gas, n-type cladding layer It is etched until the. 이에 의해, p측 컨택트층의 표면에, 예를 들면, 육각 형상의 오목부를 형성한다. As a result, the surface of the p-type contact layer, for example, to form a recess of a hexagonal shape. 오목 부의 정점간의 최장 거리는 1∼10㎛, 바람직하게는 2∼5㎛로 한다. The longest distance 1~10㎛, preferably between the vertex of the concave portion is to be 2~5㎛. 이 오목부의 형성에 의해, 리플을 억제할 수 있다. By forming the concave portion, it is possible to suppress the ripple. 이 공정은 생략해도 된다. This step may be omitted. 다음으로, p측 컨택트층(209) 및 매립층(220) 상의 표면에 Ni(100Å)/Au(1500Å)로 이루어지는 p 전극(230)을 형성한다. It forms a Next, p-type contact layer 209 and the buried p-type electrode 230 made of Ni (100Å) / Au (1500Å) on the surface (220). 그 후, Si 산화막(SiO 2 )으로 이루어지는 보호막(240)(0.5㎛)을 p 전극(230) 상 및 매립막(220) 상 및 반도체층의 측면에, 스퍼터링에 의해 성막한다. Then, Si oxide film is a protective film (240) (0.5㎛) made of a (SiO 2) on the side of the semiconductor layer and the p-electrode 230 and the embedding film 220, is deposited by sputtering. 계속해서, 600℃에서 오믹 어닐링을 행한다. Next, ohmic annealing is carried out at 600 ℃. 계속해서, 보호막으로 피복되어 있지 않은 노출되어 있는 p 전극(230) 상에 연속하여, Ni(1000Å)/Ti(1000Å)/Au(8000Å)를 이 순서로 형성하여, p 패드 전극(250)을 형성한다. Then, in succession on the p-electrode 230, which is exposed not covered by the protective film, to form a Ni (1000Å) / Ti (1000Å) / Au (8000Å) in this order, and the p pad electrode 250 forms. 그 후, 기판의 제2 주면에, V(100Å)/Pt(2000Å)/Au(3000Å)로 이루어지는 n 전극(210)을 형성한다. After that, the second main surface of the substrate to form the n electrode 210 made of V (100Å) / Pt (2000Å) / Au (3000Å). 계속해서, 기판의 제1 주면측에 오목부 홈(깊이: 10㎛, 공진면과 평행 방향의 폭: 50㎛, 수직 방향의 폭: 15㎛)을 형성한다. Subsequently, the recess in the first main surface side of the substrate groove (depth: 10㎛, the width of the resonance surface and parallel: 50㎛, the vertical width: 15㎛) to form. 이 홈을 벽개 보조선으로 하여, 기판의 n 전극의 형성면측으로부터 벽개하고, 벽개면(1-100면, 육각 주상의 결정의 측면에 상당하는 면=M면)을 공진면으로 하는 바를 얻는다. Cleavage of this groove by the auxiliary line, and cleaved from the formation face side of the n-electrode of the substrate, and to obtain bars that the cleavage plane (surface = M face corresponding to the side surface of 1 to 100, the determination of the hexagonal main phase) into the resonance surface. 공진기면에 유전체 다층막을 형성한다. To form a dielectric multilayer film on the resonator surface. 마지막으로, p 전극(230)에 평행한 방향으로, 바를 분할하고, 칩화하여 반도체 레이저 소자를 얻는다. Finally, in a direction parallel to the p electrode 230, it is divided, and chipped bar to obtain a semiconductor laser device. 얻어진 레이저 소자를, 복수개 각각 히트 싱크에 설치하고, p 전극을 와이어 본딩하여, 실온에서 레이저 발진을 시험하였다. The resulting laser device, the plurality of installed on each heat sink and the p-electrode, wire bonding, laser oscillation was tested at room temperature. 그 결과, 어느 레이저 소자도, 발진 파장 400∼420㎚, 임계값 전류 밀도 2.9 kA/㎠에서, 실온에서 양호한 연속 발진을 나타내었다. As a result, the laser device in which, at the oscillation wavelength 400~420㎚, a threshold current density of 2.9 kA / ㎠, showed good continuous emission at room temperature. 또한, 공진면에 벽개 손상이 없고, 도 9에 도시한 바와 같이 투입 전류가 140∼170㎃, 광 출력이 CW80㎽, 동작 온도가 70℃인 상태에서, 수명이 1만 시간으로, 특히 수명 특성이 좋은 레이저 소자를 재현성 좋게 제조할 수 있었다. Further, in no cleavage damage to the resonance surface, also the applied electric current, as shown in 140~170㎃ 9, the light output is CW80㎽, the operating temperature of 70 ℃ condition, life by one hour, in particular life characteristics good reproducibility is good laser device could be manufactured. 또한, 이 레이저 소자의 활성 영역의 In 조성의 불균일을, 릿지부의 아래, 또한 활성층 표면으로부터 100㎛∼400㎛의 깊이 방향의 단면에 대하여, 마이크로 포토 루미네센스(μ-PL)에 의해 측정하였다. In addition, the non-uniformity of the In composition in the active region of the laser device, below the ridge portion, and was measured by a micro-photoluminescence (μ-PL) with respect to the depth direction of the cross section from the active surface 100㎛~400㎛ . 그 결과, 도 6에 도시한 바와 같이 활성층의 In 조성의 불균일은 억제되어 있었다. As a result, the unevenness of the In composition in the active layer as shown in Figure 6 was suppressed. 또한, 비교를 위해, 기판이 오프각을 갖지 않는 것 이외에는 실시예1과 마찬가지로 제작한 소자에 대하여, 마찬가지의 측정을 하였다. Furthermore, for comparison, a substrate with respect to the elements produced in the same manner as in Example 1 except that this does not have an off angle, and the measurement of the same. 그 결과, 도 5에 도시한 바와 같이 활성층의 In의 조성 불균일은 컸다. The result was great variation in the composition of the active layer In as shown in FIG. 이하의 표에 나타내는 구성을 변경하는 것 이외에는, 실질적으로 실시예1과 마찬가지의 레이저 소자를 제작하였다. Except for changing the configuration shown in the following table it was produced substantially the laser device of Example 1 and the same. 얻어진 소자를 실시예1과 마찬가지로 레이저 발진시켰다. The laser oscillation element was obtained the same manner as in Example 1. 발진 파장 460∼480㎚, 임계값 전류 밀도 2.0kA/㎠에서, 실온에서 양호한 연속 발진을 나타낸다. In the oscillation wavelength 460~480㎚, a threshold current density of 2.0kA / ㎠, exhibit good continuous emission at room temperature. 또한, 공진면에 벽개 손상이 없고, 광 출력이 CW80㎽, 동작 온도가 60℃인 상태에서 수명이 3000 시간으로, 특히 수명 특성이 좋은 장파장 레이저 소자를 재현성 좋게 제조할 수 있다. In addition, no cleavage damage to the resonance surface, the light output is CW80㎽, with the 3000 hours of life at the operating temperature 60 ℃ state, may be particularly good reproducibility producing a long-wavelength laser device having good life characteristics. 이 실시예에서 이용한 GaN 기판은, 주면을 C면(0001)으로 하고, M면(1-100)에 대하여 수직 방향으로 오프각 a가 0.23°, 평행 방향으로 오프각 b가 0.06° 경사져 있다. GaN substrate used in this embodiment, has a main surface with C-plane (0001), and the inclined angle off a perpendicular direction 0.23 °, parallel to the off angle b are 0.06 ° direction with respect to the M plane (1-100). 또한, 이 GaN 기판의 제1 및 제2 주면에는, C면(0001)으로 이루어지는 제1 영역(1st)과, (000-1)면으로 이루어지는 제2 영역(2nd)이, 각각 400㎛와, 20㎛의 간격으로 형성되어 있었다. In addition, the first and the second main surface of the GaN substrate, the second region (2nd) made of the first zone (1st), and (000-1) plane made of a C plane (0001) is, respectively 400㎛ and, It was formed at intervals of 20㎛. 또한, 이 실시예의 레이저 소자는, 이하의 표에 나타내는 구성을 갖고 있다. 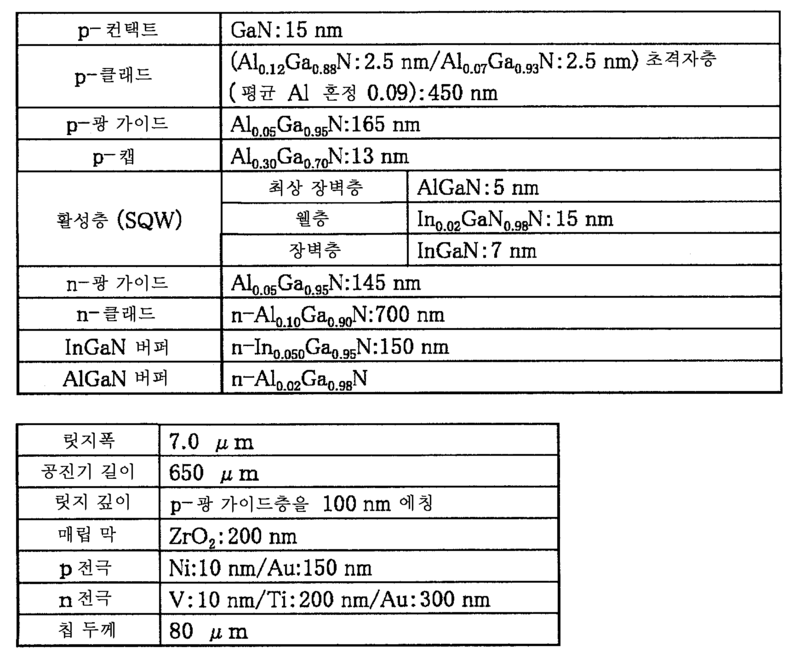 Further, the laser device of this embodiment, has a configuration shown in the following table. 그 밖에는, 실질적으로 실시예1과 마찬가지의 레이저 소자이다. What else, the laser device of the substantially same as the first embodiment by. 얻어진 소자에 대하여, 실시예1과 마찬가지로 레이저 발진시켰다. The obtained element was laser oscillation as in the first embodiment. 발진 파장 400∼420㎚, 임계값 전류 밀도 2.9kA/㎠에서, 실온에서 양호한 연속 발진을 나타낸다. In the oscillation wavelength 400~420㎚, a threshold current density of 2.9kA / ㎠, exhibit good continuous emission at room temperature. 또한, 공진면에는 벽개 손상이 없고, 광 출력이 CW80㎽, 동작 온도가 70℃인 상태에서 수명이 1만 시간으로, 특히 수명 특성이 좋은 레이저 소자를 재현성 좋게 제조할 수 있다. In addition, the resonance surface has no cleavage damage to, the light output is CW80㎽, the service life of 10,000 hours at an operating temperature of 70 ℃ conditions, and in particular to manufacture with good reproducibility the laser device is a good life characteristic. 또한, 이 레이저 소자의 활성 영역의 혼정 불균일을 마이크로 포토 루미네센스(μ-PL)에 의해 측정하였다. In addition, the non-uniform mixed crystal in the active region of the laser device was measured by a micro-photoluminescence (μ-PL). 그 결과, 도 10의 (a)에 도시한 바와 같이 제1 영역 내에서 파장이 균일하게 되어 있다. As a result, the wavelength is made uniform in the first region as shown in FIG. 10 (a). 또한, 질화물 반도체층의 표면 상태를 관찰하였다. Also, we observed the surface condition of the nitride semiconductor layer. 그 결과, 도 10의 (b)에 도시한 바와 같이, 제1 영역 내에서 반도체층의 표면 단차는 0.1㎛ 이하로 평탄화되어 있다. As a result, it is one, the surface is flattened by 0.1㎛ below the step of the semiconductor layer in the first region as shown in Figure 10 (b). 오프각 a(θ a ) 및 오프각 b(θ b )를 이하의 표에 나타낸 값으로 하는 것 이외에, 실시예3과 실질적으로 마찬가지의 소자를 제작한다. The off angle a (θ a) and off in addition to the angle b (θ b) with the values shown in the following table, in Example 3, to produce a device substantially the same. 얻어진 소자에 대하여, 실시예1과 마찬가지로 레이저 발진시키면, 모두, 실시예3과 마찬가지로, 긴 수명이며, 우수한 표면 평탄성이 얻어진다. When the laser oscillation, like Example 1, the obtained devices, both, in the same manner as in Example 3, a long life, can be obtained with excellent surface flatness. GaN 기판은, 오프각 a가 0.3°, 오프각 b가 0.05°이고, 그 위에, 이하의 표에 나타내는 구성을 갖고 있는 것 이외에, 실질적으로 실시예1과 마찬가지의 레이저 소자이다. 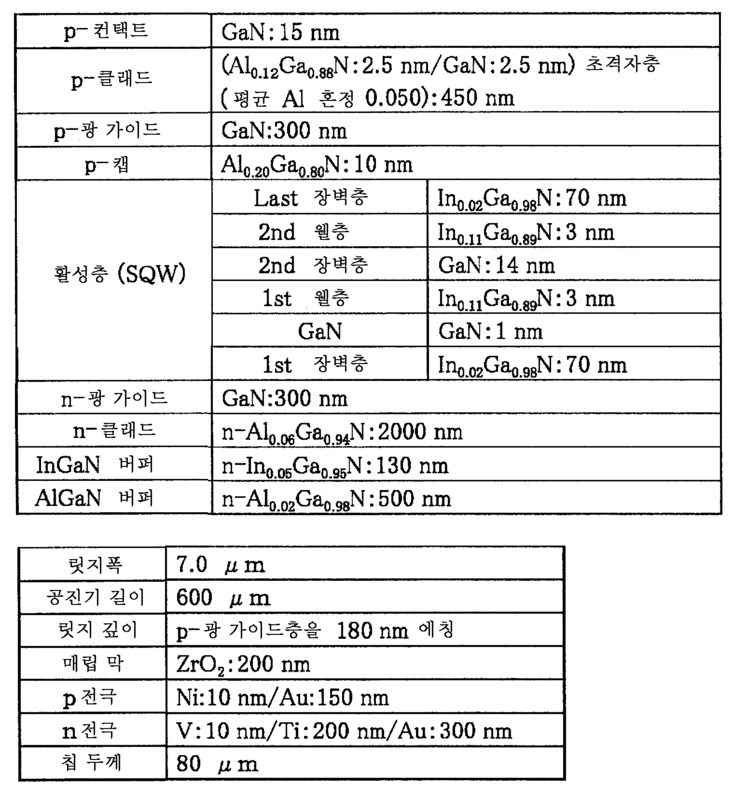 GaN substrate, the off angle a is 0.3 °, off angle b is 0.05 °, the laser device of the above in addition to, has a configuration shown in the table below, and substantially in the first embodiment too. 발진 파장 403∼407㎚, 임계값 전류 밀도 1.8∼2.0kA/㎠에서, 실온에서 양호한 연속 발진을 나타낸다. In the oscillation wavelength 403~407㎚, a threshold current density 1.8~2.0kA / ㎠, exhibit good continuous emission at room temperature. 또한, 광 출력이 CW200㎽, 동작 온도가 25℃인 상태에서 수명이 10000 시간 이상으로, 특히 수명 특성이 좋은 레이저 소자를 재현성 좋게 제조할 수 있다. The light output is CW200㎽, the life over 10,000 hours at an operating temperature of 25 ℃ conditions, and in particular to manufacture with good reproducibility the laser device is a good life characteristic. 발진 파장 373∼376㎚, 임계값 전류 밀도 3.4∼3.5kA/㎠에서, 실온에서 양호한 연속 발진을 나타낸다. In the oscillation wavelength 373~376㎚, a threshold current density 3.4~3.5kA / ㎠, exhibit good continuous emission at room temperature. 또한, 광 출력이 CW30㎽, 동작 온도가 25℃인 상태에서 수명이 8000 시간으로, 특히 수명 특성이 좋은 레이저 소자를 재현성 좋게 제조할 수 있다. The light output is CW30㎽, with the 8000 hours of life at the operating temperature 25 ℃ conditions, and in particular to manufacture with good reproducibility the laser device is a good life characteristic. 발진 파장 373∼376㎚, 임계값 전류 밀도 2.2∼2.3 kA/㎠에서, 실온에서 양호한 연속 발진을 나타낸다. In the oscillation wavelength 373~376㎚, a threshold current density of 2.2~2.3 kA / ㎠, exhibit good continuous emission at room temperature. 또한, 광 출력이 CW100㎽, 동작 온도가 25℃인 상태에서 수명이 1000 시간 이상으로, 특히 수명 특성이 좋은 레이저 소자를 재현성 좋게 제조할 수 있다. The light output is CW100㎽, a life of 1000 hours or more at the operating temperature of 25 ℃ conditions, and in particular to manufacture with good reproducibility the laser device is a good life characteristic. 발진 파장 442∼449㎚, 임계값 전류 밀도 2.5kA/㎠에서, 실온에서 양호한 연속 발진을 나타낸다. In the oscillation wavelength 442~449㎚, a threshold current density of 2.5kA / ㎠, exhibit good continuous emission at room temperature. 또한, 광 출력이 CW30㎽, 동작 온도가 50℃인 상태에서 수명이 10000 시간으로, 특히 수명 특성이 좋은 레이저 소자를 재현성 좋게 제조할 수 있다. The light output is CW30㎽, with 10000 Hours Lifespan at the operating temperature of 50 ℃ conditions, and in particular to manufacture with good reproducibility the laser device is a good life characteristic. 발진 파장 442∼449㎚, 임계값 전류 밀도 1.7∼1.8kA/㎠에서, 실온에서 양호한 연속 발진을 나타낸다. In the oscillation wavelength 442~449㎚, a threshold current density 1.7~1.8kA / ㎠, exhibit good continuous emission at room temperature. 또한, 광 출력이 CW150㎽, 동작 온도가 25℃인 상태에서 수명이 10000 시간으로, 특히 수명 특성이 좋은 레이저 소자를 재현성 좋게 제조할 수 있다. The light output is CW150㎽, with 10000 Hours Lifespan at the operating temperature of 25 ℃ conditions, and in particular to manufacture with good reproducibility the laser device is a good life characteristic. 발진 파장 467∼475㎚, 임계값 전류 밀도 2.9kA/㎠에서, 실온에서 양호한 연속 발진을 나타낸다. In the oscillation wavelength 467~475㎚, a threshold current density of 2.9kA / ㎠, exhibit good continuous emission at room temperature. 또한, 광 출력이 CW2㎽, 동작 온도가 50℃인 상태에서 수명이 5000 시간으로, 특히 수명 특성이 좋은 레이저 소자를 재현성 좋게 제조할 수 있다. The light output is CW2㎽, with the 5000 hours of life at the operating temperature 50 ℃ conditions, and in particular to manufacture with good reproducibility the laser device is a good life characteristic. 이하의 표에 나타내는 오프각으로 하는 것 이외에, 실시예3과 실질적으로 마찬가지의 소자를 제작한다. In addition to the off-angle as shown in the following Table as Examples 3 and actually to produce a device of the same. 이들 소자의 활성 영역의 혼정 불균일 및 질화물 반도체층의 표면 상태를, 실시예3과 마찬가지로 측정하였다. The surface condition of the non-uniform mixed crystal, and nitride semiconductor layers of the active regions of these devices were measured in the same manner as in Example 3. 그 결과, 어느 비교예에서도, 제1 영역 내에서 파장이 불균일하게 되었다. As a result, in any of Comparative Examples, the wavelength was not uniform in one region. 또한, 제1 영역 내에서 반도체층에 단차가 있어, 평탄화되어 있지 않다. In addition, there is the step difference in the semiconductor layer in the first region, it has not been flattened. 이 실시예의 소자는, 반도체층의 구성을 이하에 기재한 바와 같이 변경하는 것 이외에, 실질적으로 실시예1과 마찬가지의 소자를 제작한다. This embodiment of device, in addition to changing as described the configuration of a semiconductor layer in the following, is substantially carried out making the device of Example 1 and the same. - p측 층에서의 제1 층으로서, Al 0.1 Ga 0.9 N(20Å)/GaN(20Å)을 300회 반복한 총 막 두께 4500Å의 초격자 구조(평균 Al 혼정은 4.9%)를 갖는다. - as a first layer in the p-type layer, Al 0.1 Ga 0.9 N (20Å ) / GaN (20Å) to 300 han superlattice structure with a total thickness of 4500Å repeat has the (average Al mixed crystal is 4.9%). 또한, p 전극은, Ni/Au, n 전극은 Ti/Al로 하고, 패드 전극으로서 Ni-Ti-Au(1000Å-1000Å-8000Å)가 형성되어 있다. In addition, p electrode, Ni / Au, n electrode is formed by a Ti / Al, and a pad electrode Ni-Ti-Au (1000Å-1000Å-8000Å). 공진기 길이는 650㎛이다. The resonator length is 650㎛. 이 소자에 대하여, 어느 레이저 소자도, 발진 파장 405㎚, 임계값 전류 밀도2.8kA/㎠에서, 실온에서 양호한 연속 발진을 나타내었다. With respect to the device, which is also the laser device, the oscillation wavelength 405㎚, a threshold current density of 2.8kA / ㎠, it showed good continuous emission at room temperature. 또한, 공진면에 벽개 손상이 없고, 광 출력이 CW5㎽, 동작 온도가 60℃인 상태에서, 수명이 2000 시간 이상으로, 특히 수명 특성이 좋은 레이저 소자를 재현성 좋게 제조할 수 있었다. In addition, no cleavage damage to the resonance surface, the light output is CW5㎽, in which the operating temperature 60 ℃ condition, life over 2000 hours, there can be particularly life characteristics with good reproducibility producing a good laser device. 또한, 이 소자의 발산각 및 어스펙트비를, 각각 측정하고, 이하에 나타내는 비교예의 소자와 비교하였다. In addition, they compared the angle and the aspect ratio of the radiating element, and the element of the comparative example shown in each measurement, and less. 그 결과, 발산각에서는 약 8%, 어스펙트비에서는 약 6% 저감시킬 수 있었다. As a result, the divergence angle in the about 8%, the aspect ratio could be reduced from about 6%. 비교예는, 상술한 소자에서, 제2 n형 질화물 반도체층 및 제1 n형 질화물 반도체층을 형성하는 대신에, n형 클래드층으로서, Al 0.08 Ga 0.92 N(25Å)/GaN(25Å)을 반복하여, 총 막 두께 1.4㎛의 초격자 구조(평균 Al 혼정은 4%)를 1층만 형성하였다. 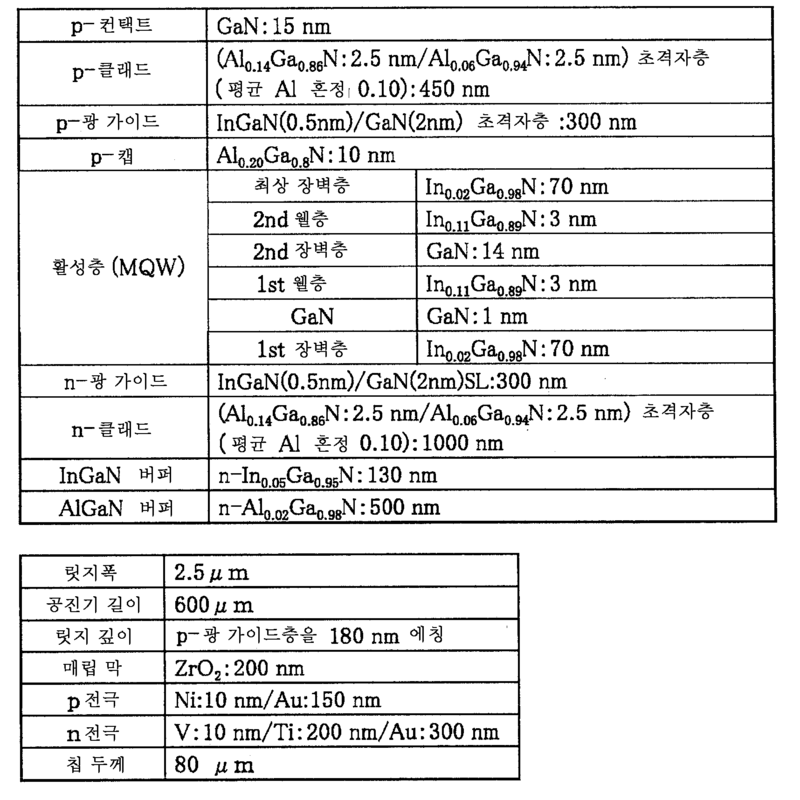 Comparative example, the in the above-described elements, the 2 n-type nitride semiconductor layer and the first, instead of forming the n-type nitride semiconductor layer, an n-type cladding layer, Al 0.08 Ga 0.92 N (25Å ) / GaN (25Å) repeatedly, the super lattice structure of total thickness 1.4㎛ to form the first layer only (average Al mixed crystal of 4%). 이 실시예는, n측 층의 제2 층을, 초격자 구조의 2층 구조로 하는 것 이외에, 실시예15의 소자와 마찬가지이다. This embodiment is similar to the second layer of the n-side layer, in addition to a two-layer structure of a superlattice structure, and the device of Example 15. 즉, 온도를 1050℃로 하고, 원료 가스에 TMA, TMG 및 암모니아를 이용하여, 비도핑의 Al 0.12 Ga 0.88 N으로 이루어지는 A층을 25Å의 막 두께로 성장시키고, 계속해서, TMA를 멈추고, 불순물 가스로서 실란 가스를 이용하여, Si를 5×10 18 /㎤ 도핑한 GaN으로 이루어지는 B층을 25Å의 막 두께로 성장시킨다. That is, by using TMA, TMG and ammonia as the temperature to 1050 ℃, and the source gas, growing a layer A made of a non-doped Al 0.12 Ga 0.88 N to a thickness of 25Å and, continuously, stops the TMA, impurities by using a silane gas as a gas, to grow a layer B made of GaN doped with Si 5 × 10 18 / ㎤ to a thickness of 25Å. 그리고, 이 조작을 각각 160회 반복하여 A층과 B층을 적층하여, 총 막 두께 8000Å의 다층막(초격자 구조)으로 이루어지는 제2 n형 질화물 반도체층의 하층을 형성한다. Then, the operation is repeated, respectively 160 times to stack the layer A and layer B to form the n-type lower layer 2 of the nitride semiconductor layer made of a multi-layered film (super lattice structure) of a total thickness of 8000Å. 이 제2 층의 하층의 평균 Al 혼정은 6%이다. The average Al mixed crystal of the lower layer of the second layer is 6%. 계속해서, 온도를 1050℃로 하고, 원료 가스에 TMA, TMG 및 암모니아를 이용하여, 비도핑의 Al 0.08 Ga 0.92 N으로 이루어지는 A층을 25Å의 막 두께로 성장시키고, 계속해서, TMA를 멈추고, 불순물 가스로서 실란 가스를 이용하여, Si를 5× 10 18 /㎤ 도핑한 GaN으로 이루어지는 B층을 25Å의 막 두께로 성장시킨다. Subsequently, the temperature at 1050 ℃, and the raw material gas by using a TMA, TMG and ammonia, growing a layer A made of Al 0.08 Ga 0.92 N of non-doped to a thickness of 25Å and, continuously, stops the TMA, by using a silane gas as the impurity gas, to grow a layer B made of GaN doped with Si 5 × 10 18 / ㎤ to a thickness of 25Å. 그리고, 이 조작을 각각 60회 반복하여 A층과 B층을 적층하여, 총 막 두께 3000Å의 다층막(초격자 구조)으로 이루어지는 제2 층의 상층을 성장시킨다. Then, the operation is repeated each 60 times, by stacking a layer A and layer B, the growth of the top layer the second layer consisting of a multi-layered film (super lattice structure) with a total thickness of 3000Å. 이 제2 층의 상층의 평균 Al 혼정은 4%이다. The average Al mixed crystal of the upper layer of the second layer was 4%. 그 후, 실시예15와 마찬가지로, 제1 n형 질화물 반도체층 이후를 형성하여, 질화물 반도체 소자를 얻는다. Thereafter, in the same manner as in Example 15, the first to form the n-type nitride semiconductor layer since, to obtain a nitride semiconductor device. 얻어진 소자에 대하여, 실시예1과 마찬가지의 평가를 행함과 함께, 발산각 및 어스펙트비를 측정하였다. The obtained element, in Example 1, with the evaluation similar to the works to measure the angle and the aspect ratio divergence. 그 결과, 실시예1과 마찬가지의 효과가 얻어졌다. As a result, in Example 1, the same effect was obtained. 또한, 상기의 비교예에 대하여, 발산각에서는 약 20%, 어스펙트비에서는 약 13% 저감시킬 수 있었다. Further, in respect to the comparative example, the divergent angle is approximately 20%, the aspect ratio could be reduced about 13%. 즉, 광의 폐쇄 효과가 완화되어 있는 것에 기인하여, FFP에서의 광의 발산 각도를 억제할 수 있어, 이에 의해, 어스펙트비를 저감시킬 수 있는 것이 확인되었다. That is, due to that the light effect closure is relaxed, it is possible to suppress the divergence angle of light in the FFP, As a result, it was confirmed that the aspect ratio can be reduced. 본 발명의 소자에 따르면, 질화물 반도체 기판의 주면이, 소정의 방향으로 오프각을 갖고 있기 때문에, 질화물 반도체층의 조성 분포나 막 두께 분포, 예를 들면, 활성층의 결정성이나 In 함유량을 균일하게 할 수 있다. According to the device of the present invention, the main surface of the nitride semiconductor substrate, since it has the off angle in a predetermined direction, the nitride semiconductor composition distribution and film thickness distribution of the layer, for example, uniform crystallinity and the In content of the active layer can do. 원자면의 단차를 기점으로 한 평탄한 결정 성장을 행할 수 있기 때문이다. Because it can be a flat crystal growth originating from the difference in level of the original sleep. 이에 의해, 기판의 주면 상에 성장하는 반도체층의 계면은, 고저차를 갖는 요철 단차가 억제되어, 발진 파장이 365㎚ 이하인 자외 영역으로부터, 500㎚ 이상인 장파장 영역에 이르는 범위를 실현할 수 있는 활성층에서, 조성 분포를 균일화할 수 있다. Thus in that manner, the interface between the semiconductor layer grown on the main surface of the substrate, the unevenness is suppressed and the step having a height difference, the oscillation wavelength can be realized in a range from a long wavelength region not less than, less than or equal to the ultraviolet region 500㎚ from 365㎚ active layer, it is possible to homogenize the chemical composition. 또한, 이러한 광범위한 파장대에서, 수명 특성 및 소자 특성이 우수한 소자를 얻을 수 있다. Further, in this broad wavelength band, it is possible to obtain a device excellent life property and device characteristics. 또한, 본 발명의 소자가, 소정의 반도체층에서, 소정의 굴절율차의 관계를 갖고 있는 경우에는, 활성층에서 발생하는 광의 체재 영역을 적절하게 조정하여, 안정된 광의 폐쇄를 행함으로써, COD 레벨을 향상시킬 수 있다. In addition, the device of the present invention, in some of the semiconductor layer, when having a predetermined relation of the refractive index difference, by properly adjusting the light stay zone generated in the active layer, by performing a stable light closure, improve COD level can. 또한, 광 강도 분포의 수직 방향으로의 발산각을 저감시켜, 어스펙트비를 최적화 또는 2 이하로 저감할 수 있다. In addition, by reducing the divergence angle in the vertical direction of the light intensity distribution, it is possible to reduce the aspect ratio to 2 or less, or optimized. 그 결과, 광의 누설에 의한 임계값 전압의 증대를 방지하고, 광 출력 효율을 향상시켜 집광율이 양호하고, 고신뢰성을 갖는 소자를 얻을 수 있다. As a result, it prevents the increase of the threshold voltage due to the leakage of light and improving the light output efficiency by light-condensing rate is good, and that it is possible to obtain a device having a reliable. 본 발명의 소자는, 광 디스크 용도, 광 통신 시스템, 인쇄기, 광 통신 시스템, 노광 용도, 측정 등의 다양한 디바이스에 이용할 수 있다. Device of the present invention can be used in various devices such as an optical disk applications, optical communications systems, printers, optical communication system, exposure applications, measurements. 또한, 특정 파장(470∼490㎚ 부근)에 감도를 갖는 물질에, 본 발명의 소자로부터 얻은 광을 조사함으로써, 그 물질의 유무 또는 위치를 검출할 수 있는 바이오 관련의 여기 광원 등에도 유용하다. Further, it is also useful in the material having a sensitivity to a specific wavelength (the vicinity 470~490㎚), the excitation light source or the like of bio-related that can be obtained by irradiating the light from the device of the present invention, to detect the presence or location of the material. |θ a |>|θ b |가 만족되는 질화물 반도체 레이저 소자. | θ a |> | θ b | nitride semiconductor laser device configured to be satisfied. 상기 기준 결정면은 (0001)면, (11-20)면 또는 (1-100)면인 질화물 반도체 레이저 소자. The reference crystal plane is a (0001) plane, (11-20) plane or (1-100) - surface nitride semiconductor laser device. 상기 질화물 반도체 기판의 주면은 (0001)면을 갖는 제1 영역과 적어도 상기 제1 영역의 결정 성장면과는 상이한 결정 성장면을 갖는 제2 영역을 포함하는 질화물 반도체 레이저 소자. The nitride semiconductor laser device to the main surface of said nitride semiconductor substrate comprises a first region having a different crystal growth surface and a crystal growth surface of the first region and at least the first region having a surface (0001). 상기 제2 영역은 (000-1)면에 있는 질화물 반도체 레이저 소자. The nitride semiconductor laser device in the second region is (000-1) plane. 상기 질화물 반도체 기판의 주면 상에서 상기 제1 영역과 상기 제2 영역이 평행한 질화물 반도체 레이저 소자. Wherein the nitride semiconductor laser device having a first region and the second region in parallel on a main surface of said nitride semiconductor substrate. 상기 제1 영역은 상기 릿지의 바로 아래에 배치되는 질화물 반도체 레이저 소자. The first region is a nitride semiconductor laser device is disposed directly below the ridge. 0.1°≤|θ a |≤0.7°가 만족되는 질화물 반도체 레이저 소자. 0.1 ° ≤ | θ a | ≤0.7 ° nitride semiconductor laser device which is satisfactory. 상기 제1 도전형을 갖는 질화물 반도체층은, Al을 포함하는 래터럴(laterally) 성장시킨 층을 포함하는 질화물 반도체 레이저 소자. The nitride semiconductor laser device of a nitride semiconductor layer having the first conductivity type, comprises a lateral (laterally) in which growth layer including Al. 상기 코어 영역의 최외층과 상기 제1 질화물 반도체층의 사이에, 및 상기 제1 질화물 반도체층과 상기 제2 질화물 반도체층의 사이에 굴절율차가 존재하는 질화물 반도체 레이저 소자. The nitride semiconductor laser device that between the outermost layer and the first nitride semiconductor layer of the core region, and a difference in refractive index between the first semiconductor layer and the second nitride semiconductor layer is present. 상기 제1 질화물 반도체층은 상기 코어 영역의 최외층보다 작은 굴절율을 갖는 질화물 반도체 레이저 소자. The first nitride semiconductor layer may be a nitride semiconductor laser device having a smaller refractive index than the outermost layer of the core region. 상기 제2 질화물 반도체층은 상기 제1 질화물 반도체층보다 작은 굴절율을 갖는 질화물 반도체 레이저 소자. The second nitride semiconductor layer may be a nitride semiconductor laser device having a smaller refractive index than the first nitride semiconductor layer. 상기 코어 영역의 최외층과 상기 제1 질화물 반도체층 사이의 굴절율차(Δn 1 ) 및 상기 제1 질화물 반도체층과 상기 제2 질화물 반도체층 사이의 굴절율차(Δn 2 ) 중 적어도 하나는 0.004 내지 0.03인 질화물 반도체 레이저 소자. At least one of the outermost layer of the core region and the first refractive index difference between the first nitride semiconductor layer (Δn 1) and the first nitride semiconductor layer and the first refractive index difference between the second nitride semiconductor layer (Δn 2) is 0.004 to 0.03 a nitride semiconductor laser device. 상기 제m(m≥2)의 n형 질화물 반도체층의 굴절율은 상기 제1 p형 질화물 반도체층의 굴절율보다 큰 질화물 반도체 레이저 소자. Wherein the refractive index of the n-type nitride semiconductor layer of the m (m≥2) is greater than the refractive index of the nitride semiconductor laser device of claim 1 wherein the p-type nitride semiconductor layer. 상기 제m(m≥2)의 n형 질화물 반도체층과 상기 p형 질화물 반도체층 사이의 굴절율 차(Δn)는 0.004 내지 0.03인 질화물 반도체 레이저 소자. Refractive index difference (Δn) is a nitride semiconductor laser device of 0.004 to 0.03 between the first m (m≥2) n-type nitride semiconductor layer and the p-type nitride semiconductor layer. 상기 제m(m≥2)의 n형 질화물 반도체층과 상기 코어 영역의 최외층 사이의 굴절율 차(Δn m )는, 0.007 내지 0.05인 질화물 반도체 레이저 소자. Wherein m (m≥2) refractive index difference (Δn m) between the outermost layer of the n-type nitride semiconductor layer and the core region of the nitride semiconductor laser element, 0.007 to 0.05. 질화물 반도체 레이저 소자. The nitride semiconductor laser device. 상기 질화물 반도체 기판의 주면은 C면(0001)을 포함하는 제1 영역과 적어도 상기 제1 영역의 결정 성장면과는 상이한 결정 성장면을 갖는 제2 영역을 포함하는 질화물 반도체 레이저 소자. Major surface nitride semiconductor laser device including a second region having a second surface different from the crystal growth and crystal growth surface of the first region and at least the first region including a C-plane (0001) of said nitride semiconductor substrate. 상기 제1 영역 및 상기 제2 영역은 스트라이프 형상으로 분단된 극성들을 갖는 질화물 반도체 레이저 소자. The first region and the first nitride semiconductor laser device having two regions of the divided polarized in stripes. 상기 제1 도전형을 갖는 질화물 반도체층은 알루미늄을 함유하는 래터럴 성장시킨 질화물 반도체층을 포함하는 질화물 반도체 레이저 소자. The nitride semiconductor laser device of a nitride semiconductor layer having the first conductivity type comprises a lateral growth in which a nitride semiconductor layer containing aluminum. 상기 제m(m≥2)의 n형 질화물 반도체층과 상기 p형 질화물 반도체층 사이의 굴절율차(Δn)는 0.004 내지 0.03인 질화물 반도체 레이저 소자. Refractive index difference (Δn) is a nitride semiconductor laser device of 0.004 to 0.03 between the first m (m≥2) n-type nitride semiconductor layer and the p-type nitride semiconductor layer. 상기 제m(m≥2)의 n형 질화물 반도체층과 상기 코어 영역의 최외층 사이의 굴절율차(Δn m )는 0.007 내지 0.05인 질화물 반도체 레이저 소자. Wherein m (m≥2) refractive index difference (Δn m) between the outermost layer of the n-type nitride semiconductor layer and the core region of the nitride semiconductor laser device of 0.007 to 0.05. 상기 활성층은 인듐을 포함하는 질화물 반도체 레이저 소자. The active layer is a nitride semiconductor laser device comprising indium. 상기 활성층은 다중 양자 우물 구조 및 단일 양자 우물 구조 중의 한 우물 구조를 갖고, 상기 활성층은 인듐을 함유하는 우물층을 포함하는 질화물 반도체 레이저 소자. The nitride semiconductor laser device in which the active layer includes a well layer comprising a multiple quantum well structure and a single quantum well structure having a one in the well structure, the active layer is indium. 상기 활성층은 In x Al y Ga 1-xy N (0<x≤1, 0≤y<1, 0<x+y≤1)로서 표현되는 반도체층을 포함하는 질화물 반도체 레이저 소자. The nitride semiconductor laser device in which the active layer comprises a semiconductor layer is expressed as In x Al y Ga 1-xy N (0 <x≤1, 0≤y <1, 0 <x + y≤1). 상기 우물층은 10 옹스트롬 내지 300 옹스트롬 범위의 막 두께를 갖는 질화물 반도체 레이저 소자. The well layer is a nitride semiconductor laser device having a film thickness ranging from 10 angstroms to 300 angstroms. 상기 활성층의 우물층은 인듐의 함량이 0.5 이하인 혼합 결정인 질화물 반도체 레이저 소자. Well layer of the active layer of the nitride semiconductor laser device in the content of indium of 0.5 or less mixed crystal.